World armed services are not anymore defined by their firepower or size. There is now a new equation to fighting conflicts that are on a global scale... Logistics. How quickly and how many personnel and equipment can be moved can make the difference between success and failure in a war zone. The old background areas of the services are now the front line in advance and retreat. Putting "Boots on the ground" or quickly removing them to safety is paramount and can deem a mission a success or failure. 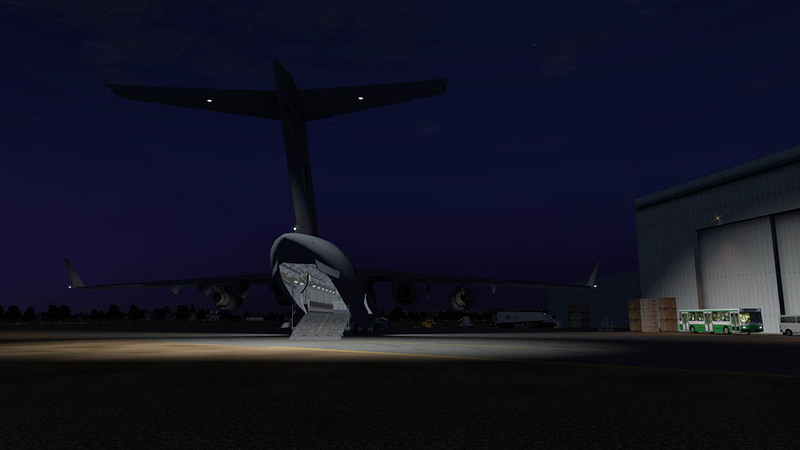 Your front line weapons are huge transporters with older C5-A Galaxy's and An-124 Ruslan's (Nato : Condor), and the current C-17 Globemaster as the defining aircraft in this category that replaced the C-141 Starlifter as the main strategic airlifter in the U.S. military. 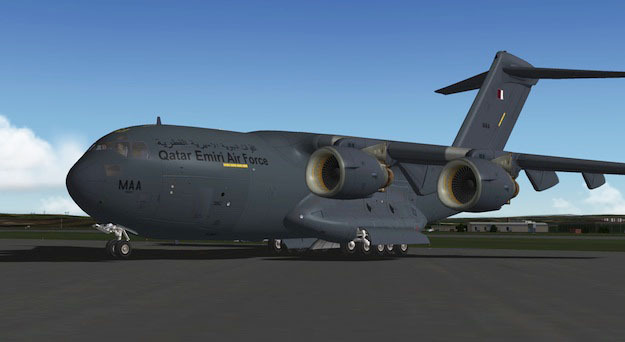 Australia, Canada, India, NATO, Kuwait, Qatar, United Arab Emirates and the United Kingdom also have the C-17 in their fleets. 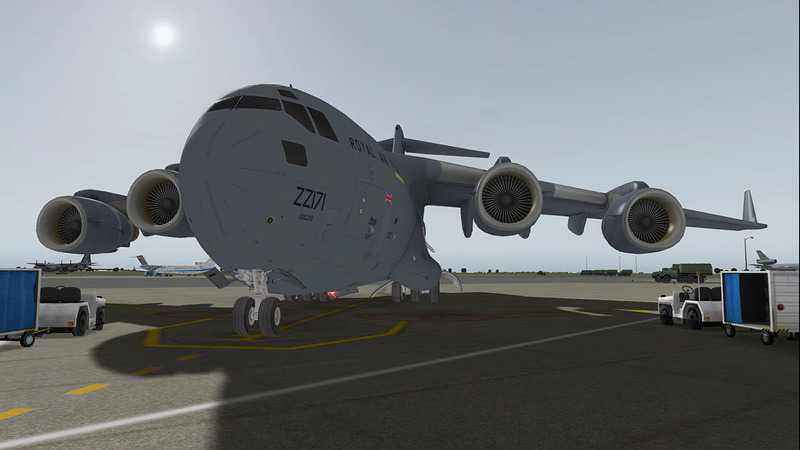 Australia purchased only three C-17 aircraft and now have five, and has ordered three more in noting how flexible and the capability these aircraft can give a country in not only for conflicts but for human resources in times of weather and disaster relief to which are becoming more frequent in time and scale. The Boeing C-17 Globemaster III was developed for the United States Air Force (USAF) from the 1980s to the early 1990s by McDonnell Douglas and the company was later merged with Boeing. This grew out of the USAF set mission requirements to replace the C-141 Starlifter and a request for proposals (RFP) to cover the C-X Program (Advanced Medium STOL Transport) in October 1980. 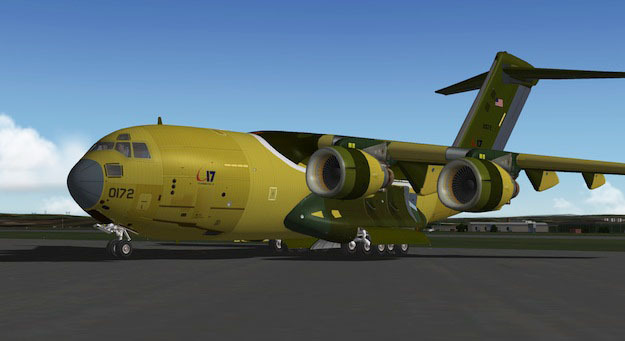 McDonnell Douglas elected to develop a new aircraft based on the YC-15; Boeing bid an enlarged three-engine version of its AMST YC-14. 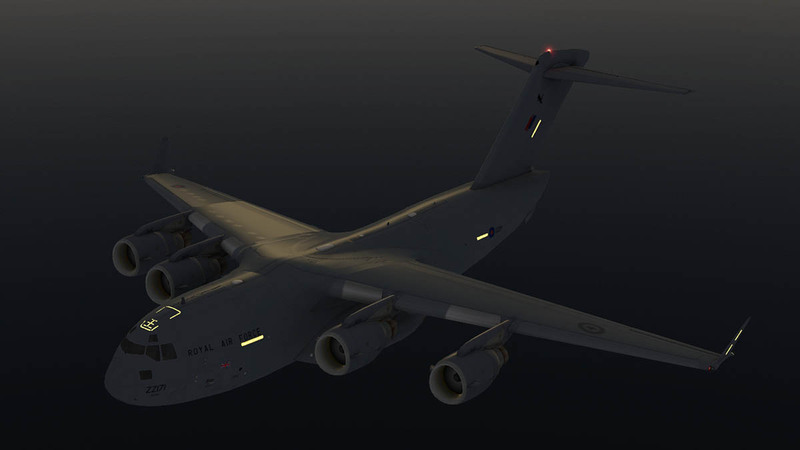 Lockheed submitted two designs, a C-5-based design and an enlarged C-141 design. 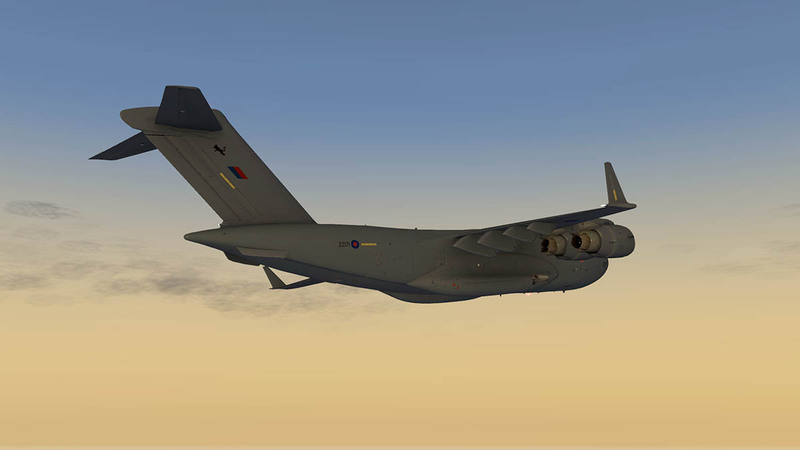 On 28 August 1981, McDonnell Douglas was chosen to build its proposed aircraft, then designated C-17. Compared to the YC-15, the new aircraft differed in having swept wings, increased size, and more powerful engines.This would allow the C-17 to perform the work done by the C-141, and also fulfill some of the duties of the current Lockheed C-5 Galaxy. 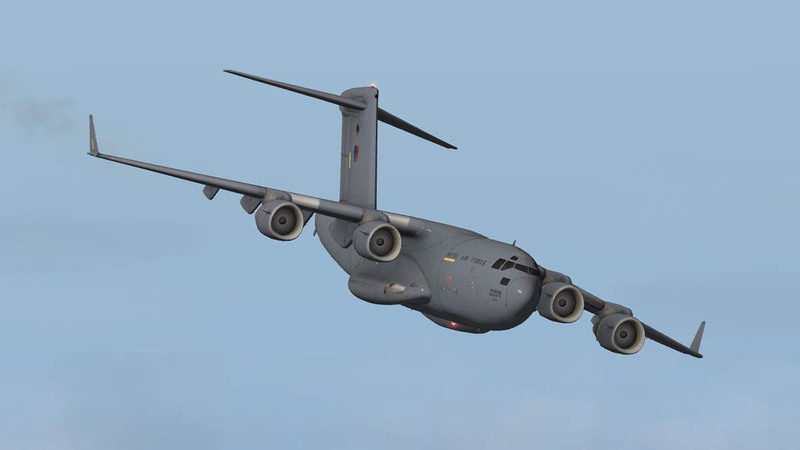 The maiden flight of the C-17 took place on 15 September 1991 from the McDonnell Douglas's plant in Long Beach, California and about a year behind schedule. The first aircraft (T-1) and five more production models (P1-P5) participated in extensive flight testing and evaluation at Edwards Air Force Base. 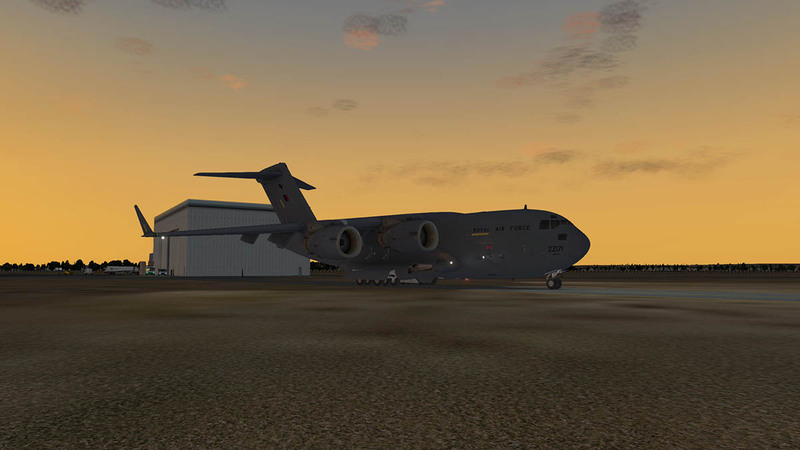 The first C-17 squadron was declared operational by the USAF in January 1995. Performance for an aircraft of this size is outstanding. 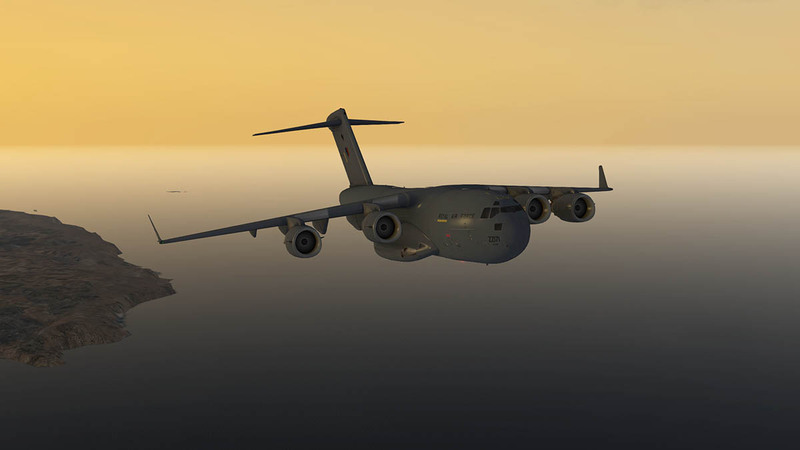 The C-17 is 174 feet (53 m) long and has a wingspan of about 170 feet (52 m). 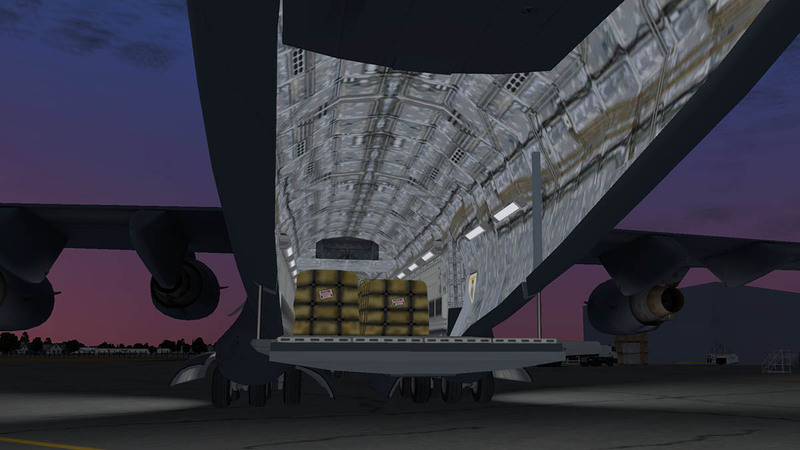 It can airlift cargo fairly close to a battle area. 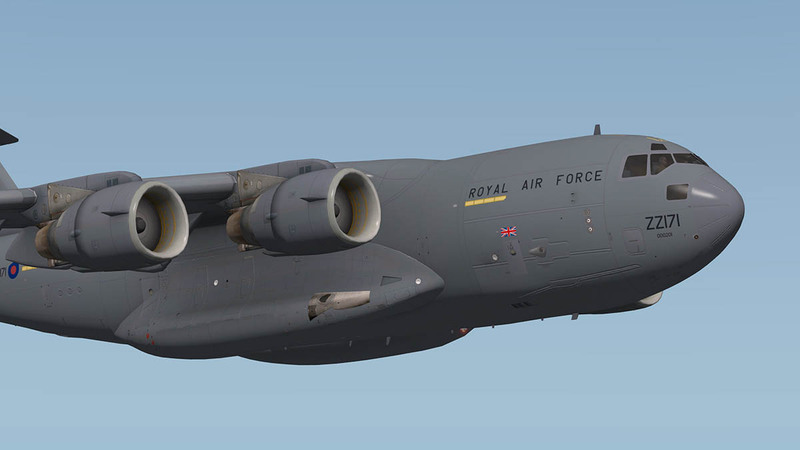 The C-17 is powered by four Pratt & Whitney F117-PW-100 turbofan engines, which are based on the commercial Pratt and Whitney PW2040 used on the Boeing 757. 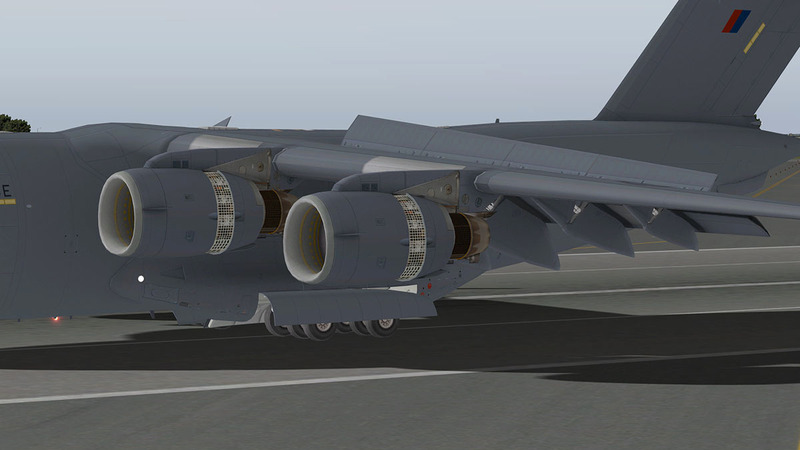 Each engine is rated at 40,400 lbf (180 kN) of thrust. The engine's thrust-reversers direct engine exhaust air upwards and forward, reducing the chances of foreign object damage by ingestion of runway debris, and providing enough reverse thrust to back the aircraft up on the ground while taxiing and can manoeuvre around narrow taxiways using a three- (or more) point turns. 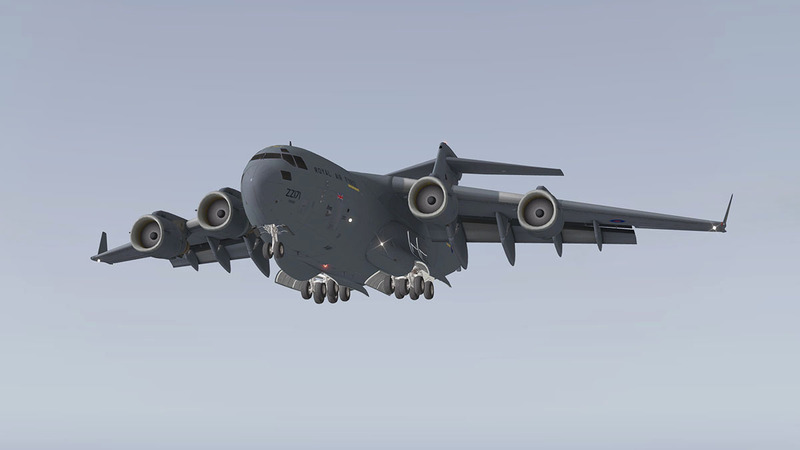 Maximum payload of the C-17 is 170,900 lb (77,500 kg), and its Maximum takeoff weight is 585,000 lb (265,350 kg). 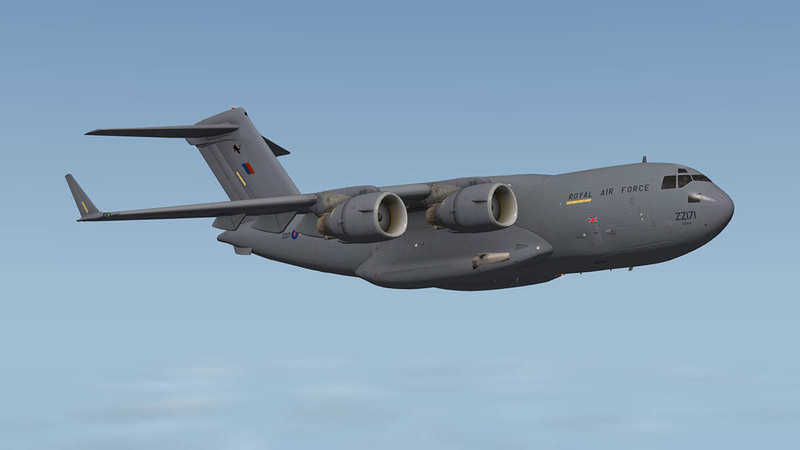 With a payload of 160,000 lb (72,600 kg) and an initial cruise altitude of 28,000 ft (8,500 m), the C-17 has an unrefueled range of about 2,400 nautical miles (4,400 km) on the first 71 aircraft, and 2,800 nautical miles (5,200 km) on all subsequent extended-range models that include a sealed center wing bay as a fuel tank. 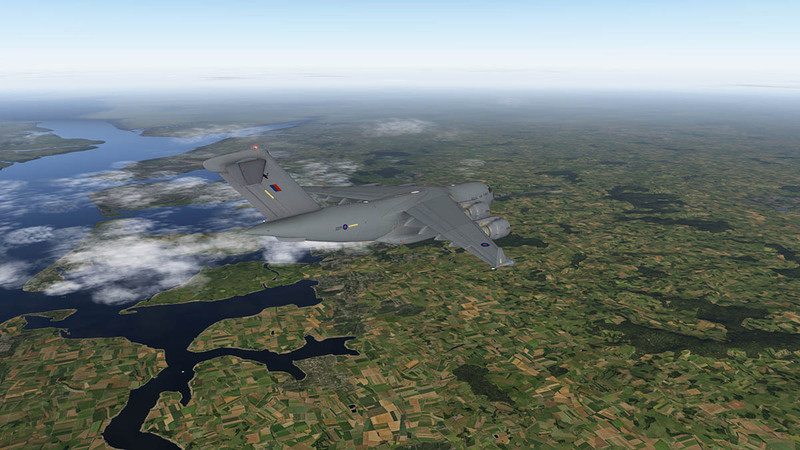 Boeing informally calls these aircraft the C-17 ER (as flown by the RAF). 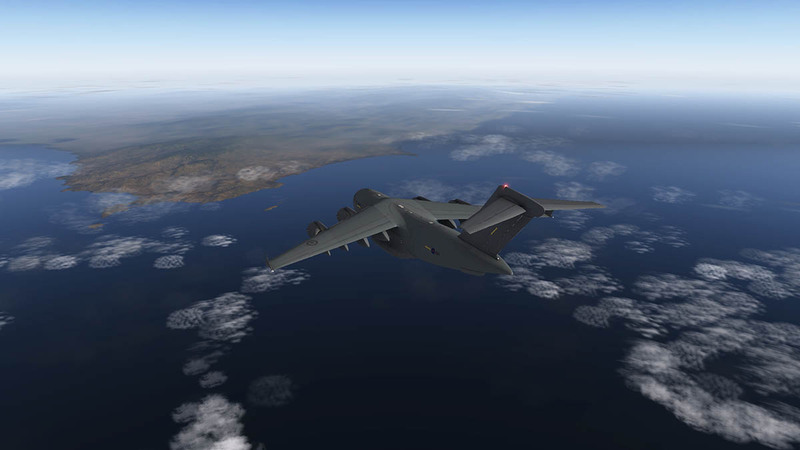 The C-17's cruise speed is about 450 knots (833 km/h) (Mach 0.74). It is designed to airdrop 102 paratroopers and their equipment. The U.S. Army's Ground Combat Vehicle and Chinook helicopter or three Apache-sized helicopters. It carries all its own role-equipment and can fit centre-line seating, which increases the seating capacity from 54 side-wall seats to 102 seats. 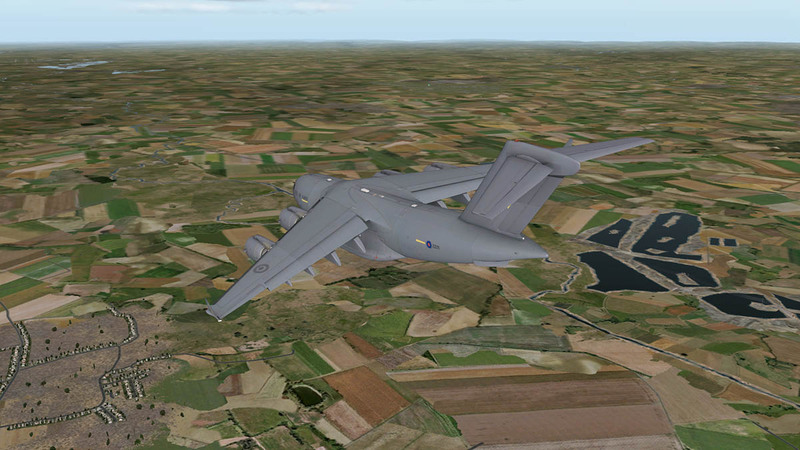 The C-17 is designed to operate from runways as short as 3,500 ft (1,064 m) and as narrow as 90 ft (27 m). In addition, the C-17 can operate from unpaved, unimproved runways (although with greater chance of damage to the aircraft). 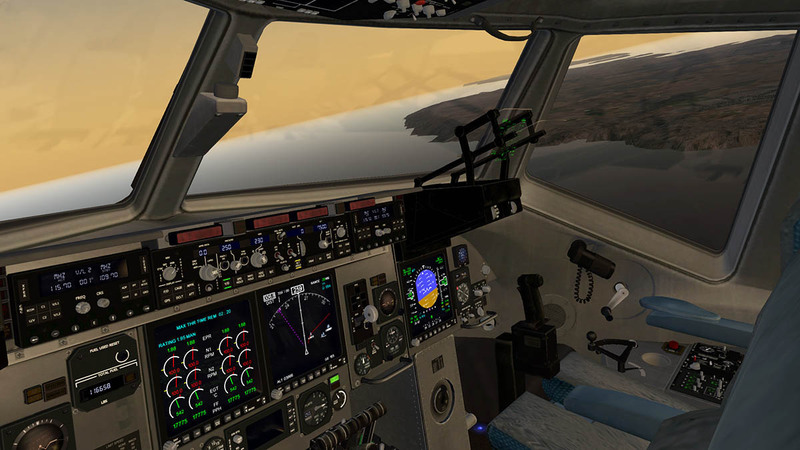 Vitavia released the MS-FSX version Jun 6, 2011, then later Dawson Designs reconfigured the aircraft for X-Plane and that version was released on 7th August 2012, there was an update (for 64bit) in May 2013, but otherwise the aircraft is the same as the release version. Overall the aircraft does not feel its age as it was very advanced for its time of release. 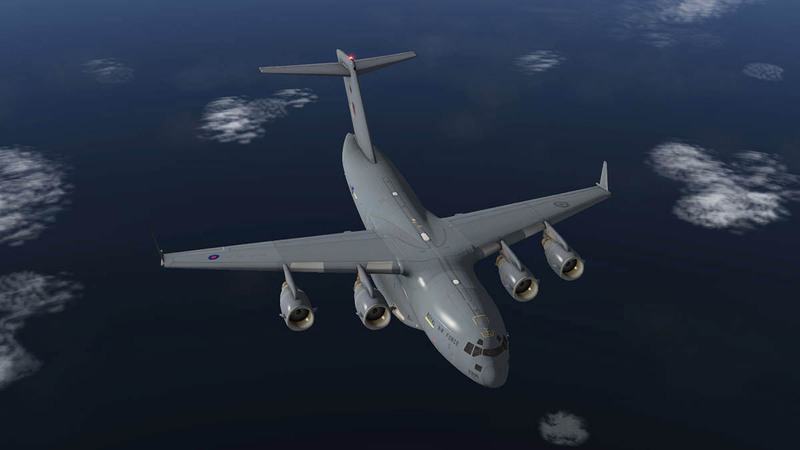 Make no mistake that getting your head around flying a Globemaster requires a bit of orientation, It is a military machine through and through and everything is quite different. Sit the cockpit for the first time and you feel like you are on a different planet, the idea is the same and every standard system to fly an aircraft are all set out in the usual context, but you really have to learn the differences to understand what everything does as mostly everything is labeled differently, then suddenly it all clicks in your mind and then it all becomes quite easy and familiar. I certainly recommend to read the manual right through before attempting to do any serious flying, It is not long at 30 pages but just sit it in your lap (iPad?) or print it out and get the placement of everything noted down - doing this simple task will save you hours of fumbling around wondering what the hell does what and yes any time on a commercial heavy (Boeing 747-400) will give you an idea on how to fly it - but it does fly quite differently in many aspects and that will take a little time and practice to smooth the bumps out. 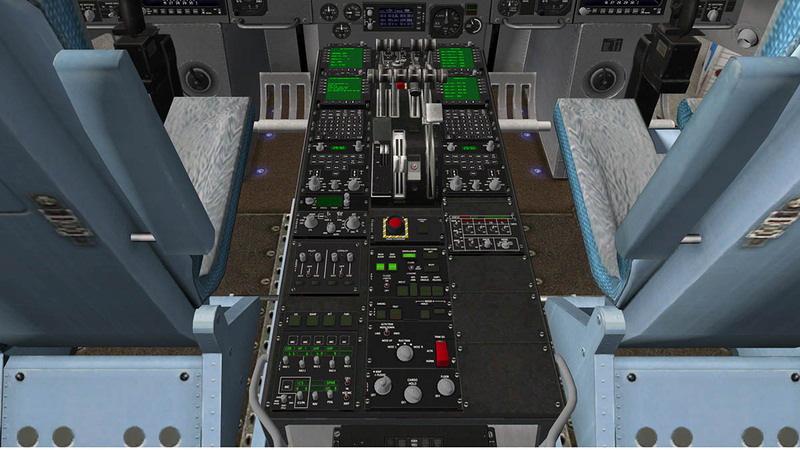 Your going to work in there, the systems however are not that deep but are very functional and you will need to be very precise and smooth to get the best performance out of the aircraft. 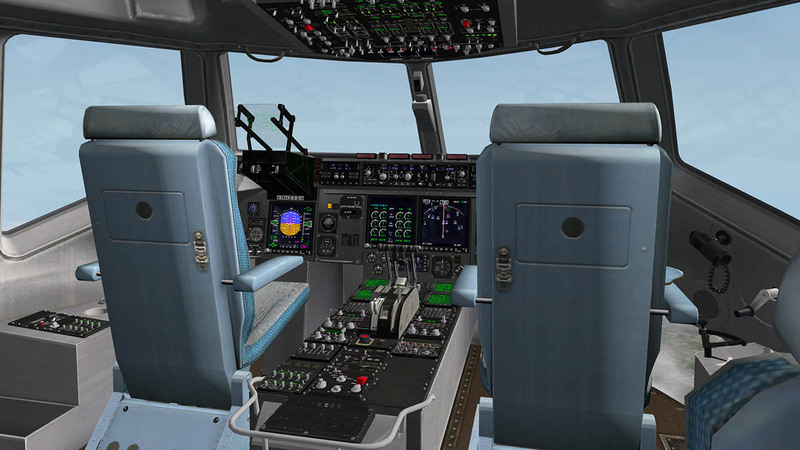 The C-17 Globemaster's cockpit is full 3d and very well detailed and recreated. Authentic? yes certainly it looks excellent and most buttons and switches work. 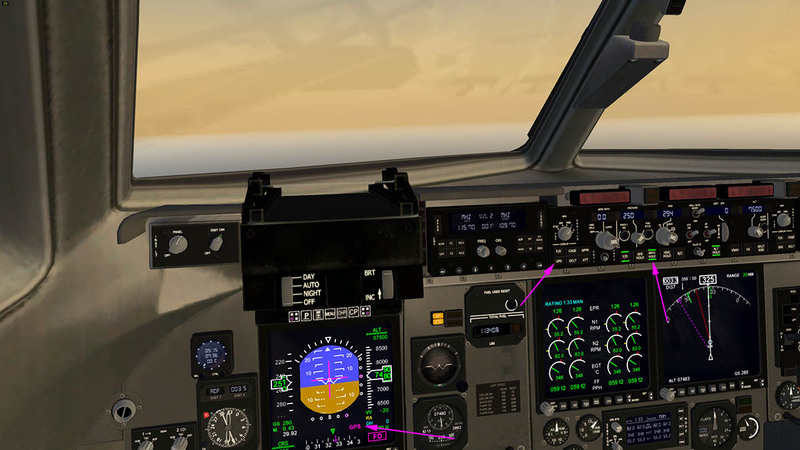 Pilot's and Co-Pilot's stations are the same and both are based around a large Primary Flight Display (PFD) with the HUD system built in on top. 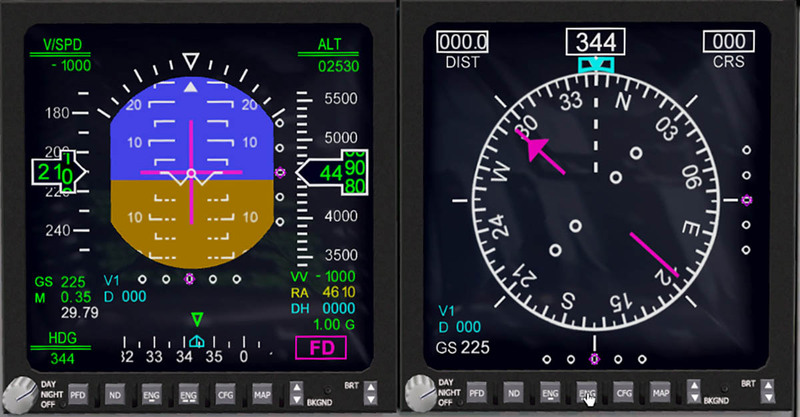 The PFD has the Artificial Horizon and Pitch degrees central with the Turn Rate at the top. Altitude and Speed tapes are both sides but the speed tape is different than on an airliner as it changes speeds opposite with the higher speed lower and the low speeds moving upwards military style, and that takes a little getting used to. 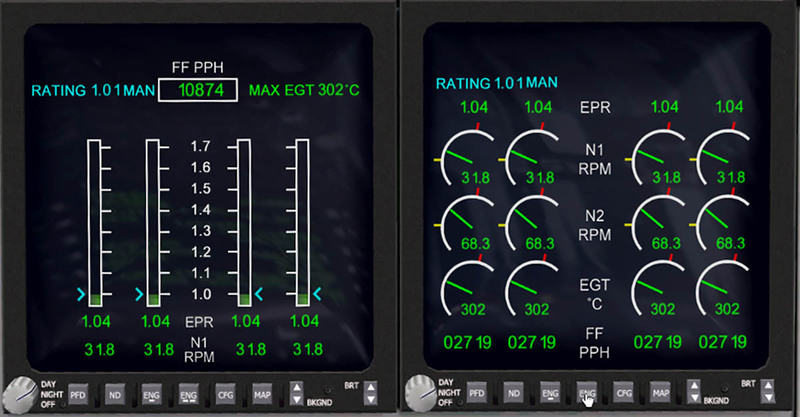 ILS guides are on the PFD display as well on the right (Vertical) and bottom (Horizontal). Lower bottom is the heading indicator. Left side are the VOR 1 - VOR 2 dials and distance and on the right is the backup standby artificial horizon/pitch globe and altitude/heading indicator. On the glareshield in the centre is the Autopilot flanked each side by AFCS panel's which is noted as the CNC ‘Communication Navigation Control’ or radio panels. V/L1 and V/L2 are the VOR 1 & 2 freq's respectively and ADF is the NDB setting. COMM 1 and COMM 2 and IFF (IFF Mode) Transponder settings are also set here, you dial in by "Freq" and exchange the freq over to active by pressing the XFER button on the left. You can set the Course (CRS) for use on the rose. 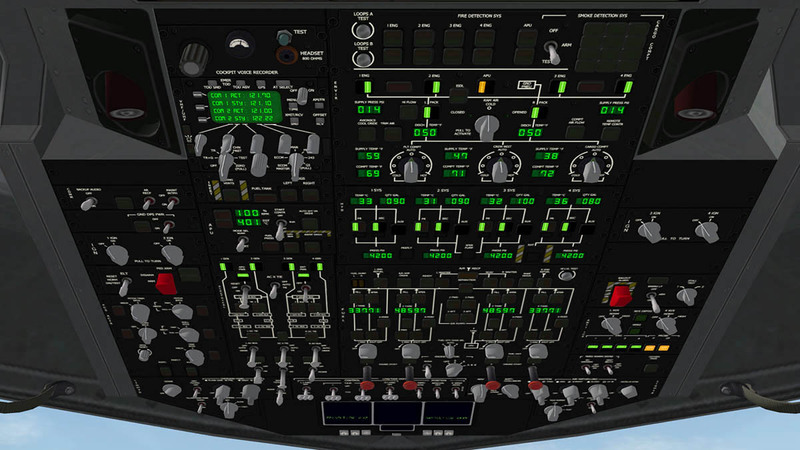 I will go through the Autopilot panel during the flight as it is better explained in operation. The cockpit panels are complex but are very well laid out, The four display screens all work independently of each other so you can choose what you want on any of the screens, that is either with the PFD’s (Primary Flight Displays) or any of the two centre screens, the beauty of this is if you are on a long sector you can bring the map up in front of you or any of the other displays, mostly the engine and map setting modes will stay on the centre screens, but you can still have them if you want them...so let us go through the various modes. Selection is via the buttons on the bottom of the displays. Map changes and APP/VOR/MAP/NAV/PLN selections are on the left and right of the middle console. 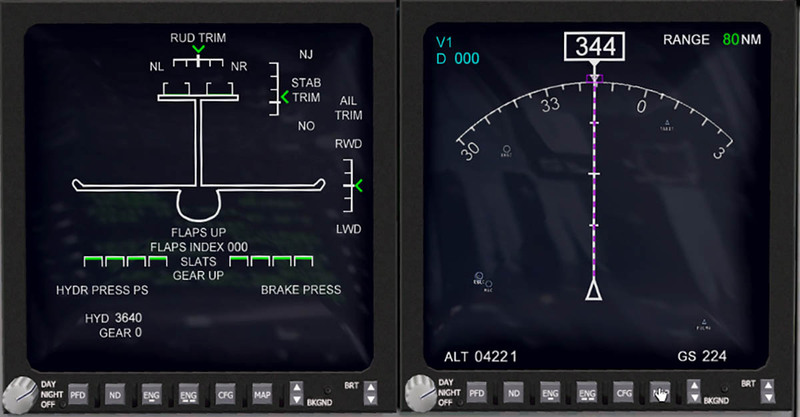 The Huge HUD in front of you can be adjusted for brightness and if not needed then lowered, this is excellent animation as it folds away and both the Pilot and Co-Pilot’s HUD’s can be lowered out of the way... Just by pressing the centre of the block area. Lower in the HUD is the menu “views”; this is an excellent way of combining a menu with functionality - no side tabs here! These menu buttons give you: 1) Left Rear Jump Seat - 2) Pilot View - 3) Pedestal - 4) Control Panel - 5) Overhead Panel - 6) Co-Pilot View - 7) Right Rear Jump Seat. The "Control Panel" allows you to adjust fuel simply by clicking and dragging each blue fuel tank level to adjust. The same method is used for cargo. The cargo hold will then automatically filling the rear with cargo pallets and increasing in number depending on the cargo quantity entered. 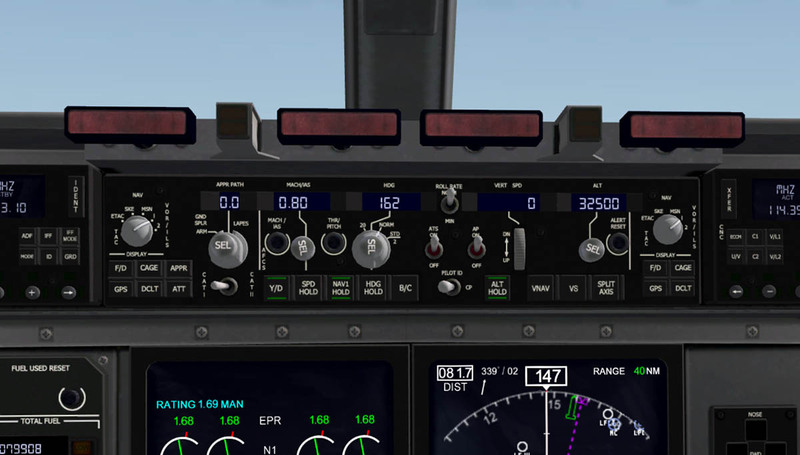 When you reach max aircraft weight, the total weight digital display will turn red. 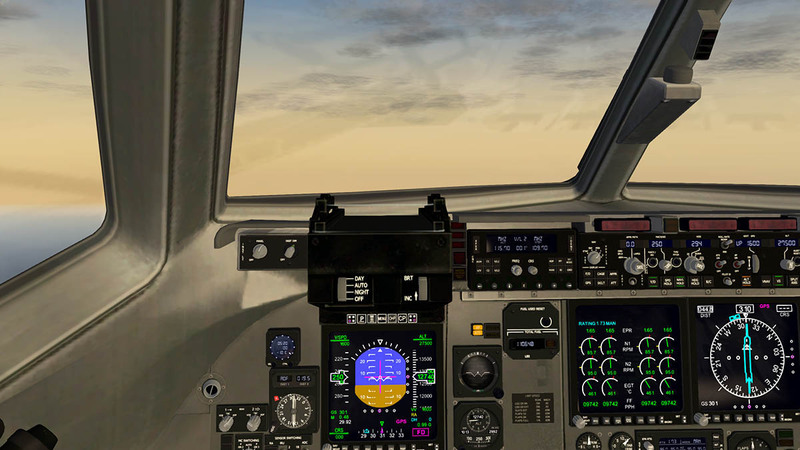 You can use this as well as the standard X-Plane menu "Fuel & Weight" settings as it is very easy to overload the weight and not have enough fuel for the distance, so you have to find the right balance of weight to endurance. 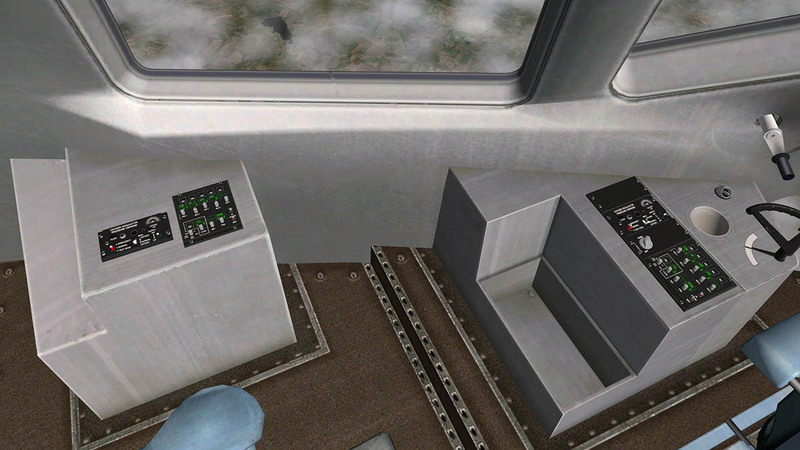 There are also options on the control panel to open and close aircraft doors and the rear ramp. 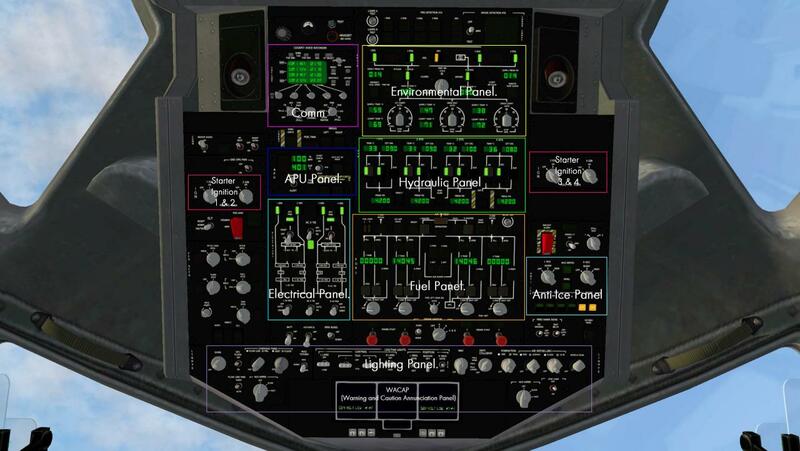 The overhead panel looks quite complex, but it is really quite easy if you know were all the zones are: Backup COMMs Panel - Environmental Panel - APU Panel - HYD Panel (Hydraulics) - Electrical Panel - Fuel Panel - IGN Engine Igniter Switches (1 & 2 left - 3 & 4 right) - Anti-Ice Panel - and combined at the front is the: Lighting Switches (Internal and External) - Air Refueling Panel - WACAP Panels (Warning and Caution Annunciation Panel). All the main systems are functional but there are no failures or smaller details that work. Centre pedestal is again more simple than it looks. Central are the huge engine levers (thrust reverse levers), Park Brake, Flaps and Stabiliser Trim levers. A note is that there is no “Speed Brake” arm to automatically deploy on landing, On the C-17 it is on the control column but not simulated here, so the notes state that to use the keys 3/4 to deploy the Speed Brakes, but they do come out in two stages so it is a two button press, I have a Speed brake on my joystick anyway so it works fine there, so I suggest setting a key correctly to the “Full” or as I have on "spoiler up one" mode. Top on each side are Mission Computer Displays (MCD). The MCD's are non-interactive, although each can be independently switched on or off. They display useful aircraft and communication information including the FMC information, they are more useful than you think they are. 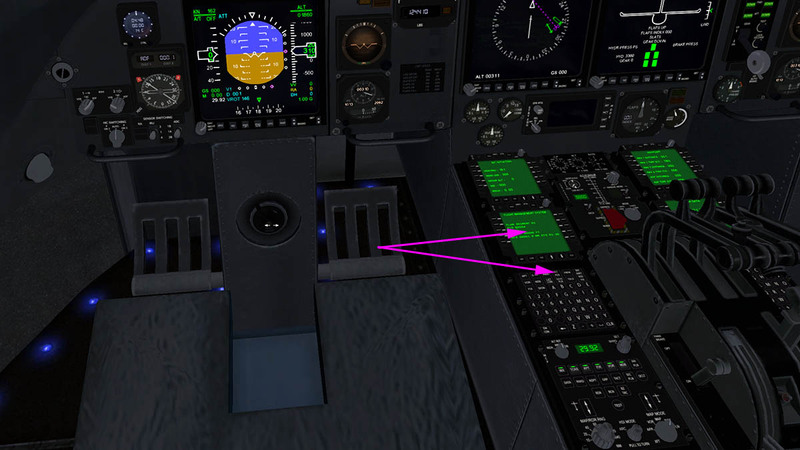 Below are the two Flight Management System (FMS) keyboards, used for entering flight plans. You can also load and save fms. flight plans. purely basic X-Plane in operation, but you have to study (or note) the keys to translate what they are to the standard X-Plane default panel. 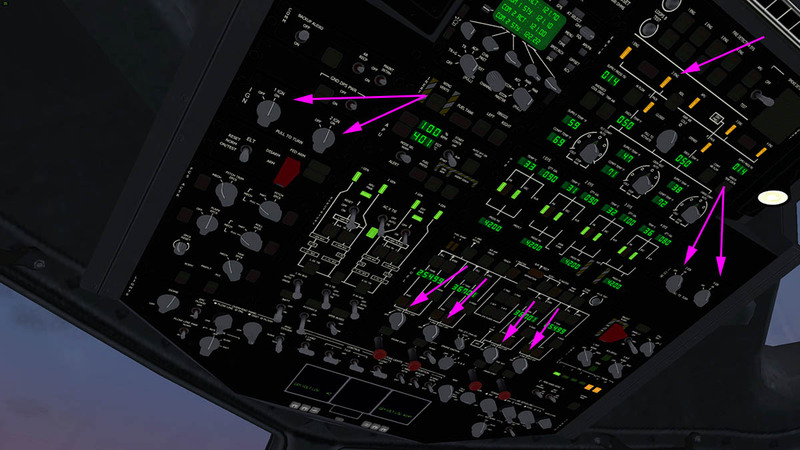 Each side lower centre is the MAP controls EFIS Map zoom range, which in most cases you have to move the armrest to see it (and turn the knob), it is tricky but do-able to have the zoom switch and the map in the same view. adjustment for range (noted as MAP/RDR RNG), waypoint display and MAP selection in VOR/APP/MAP/NAV/PLN. lower pedestal is the comm radio controls and aircraft door states/open/closed and general lighting knobs for footwell and internal Cargo hold lighting switches. 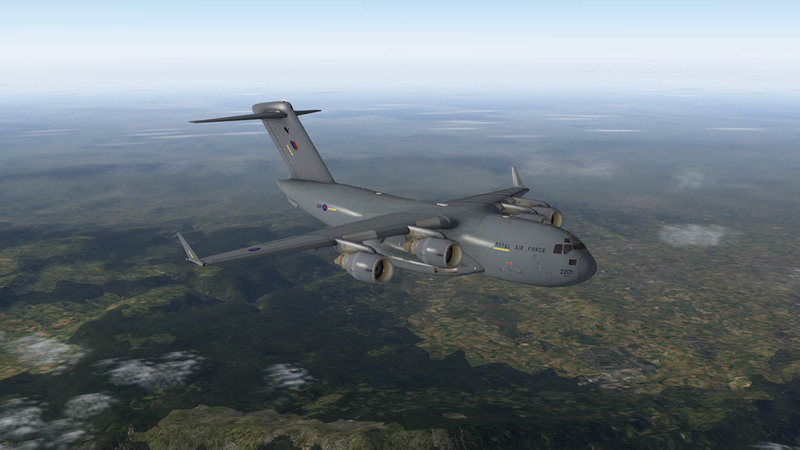 Over the last few years of flying the C-17 Globemaster III, I have built up a few routes and one of my favorite was a supply route from the UK to Afghanistan via Malta and Abu Dhabi which were both fuel stops. 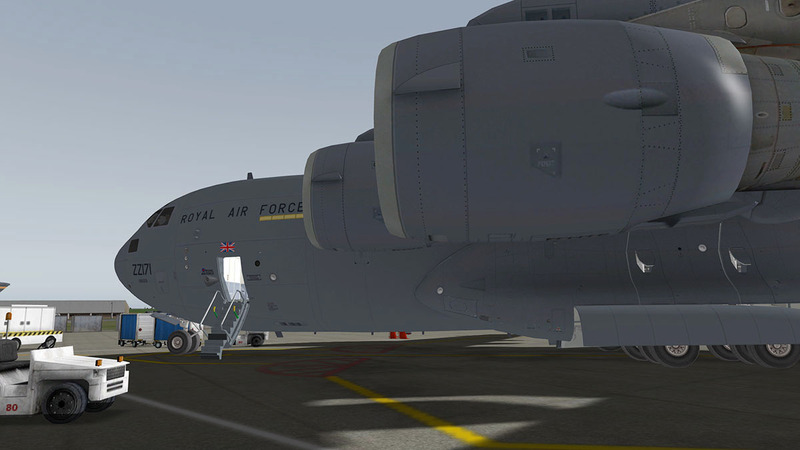 Operations in Afghanistan are now over (to a point), but I wanted to retrace the route down to Malta (LMML) and back again to Brize Norton (United Kingdom) as a supply mission. 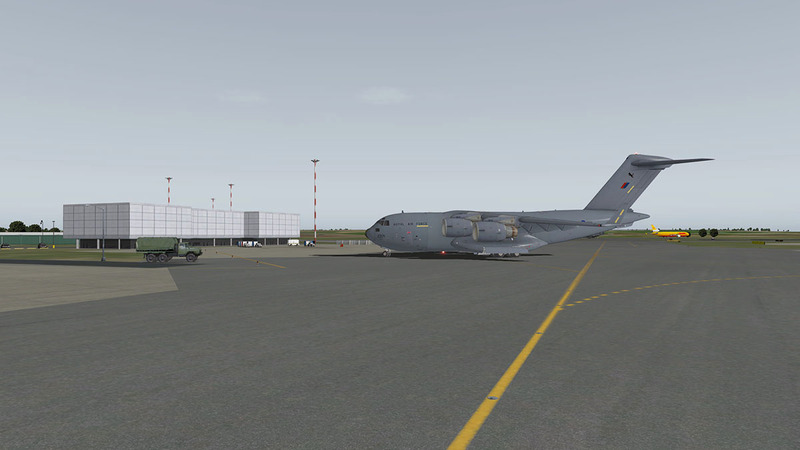 Yesterday I flew down to Luqa/Valletta Airport and now here we will fly back to the UK. 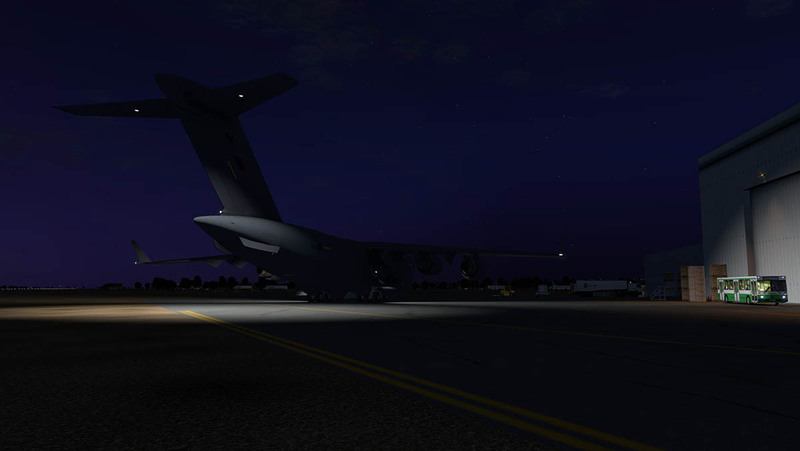 Departure is early, so the lighting systems on the C-17 are excellent to prepare the aircraft for flight. 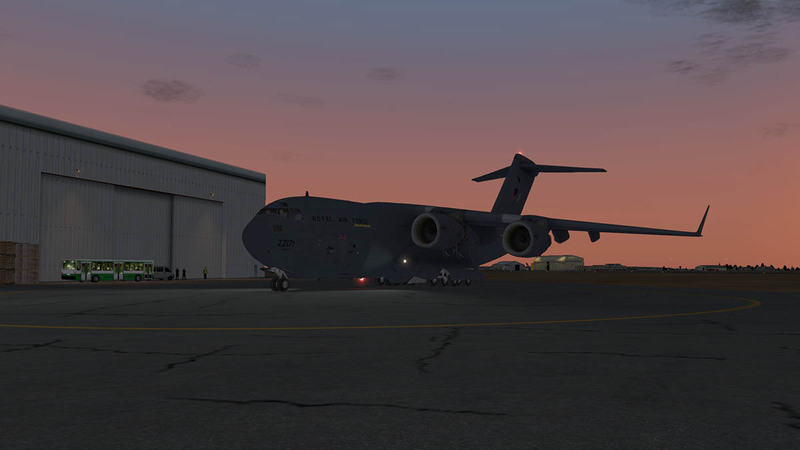 C-17's have to be totally self-sufficient when landing in remote regions and here you can load your aircraft with no help from the outside facilities. 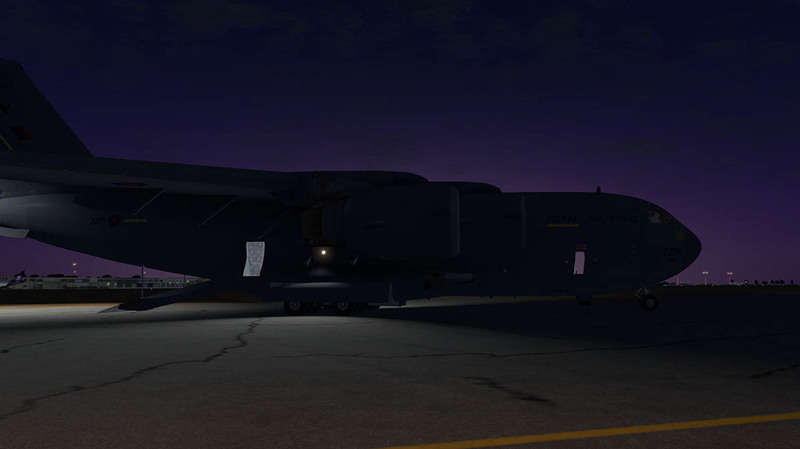 The high T-Tail lighting combined with both fuselage side "Flood" lighting gives you a great spread of light that is better than any cargo base, open the huge rear tail doors and the light spills out from the inside of the aircraft as well (adjustable). 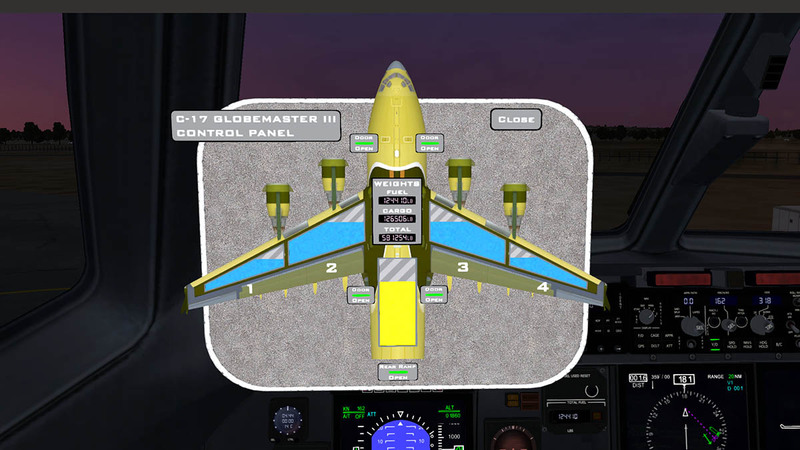 In the cockpit you have adjustable "Dome" lighting to set the aircraft up. There are two rear "Troop" loading doors, Main Exit door (forward left) with stairs and a right side door. The main rear cargo doors and ramp has two positions, "Air-Drop" which is half-open and "full" with folding ramps. 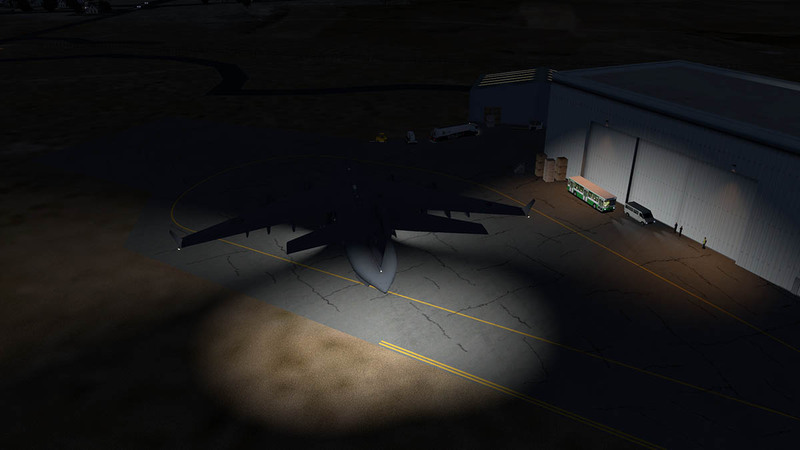 Main aircraft lighting gives you four forward landing lights with two on the fuselage and two on the end of each wing. There is also two "Taxi" lights on the fuselage. 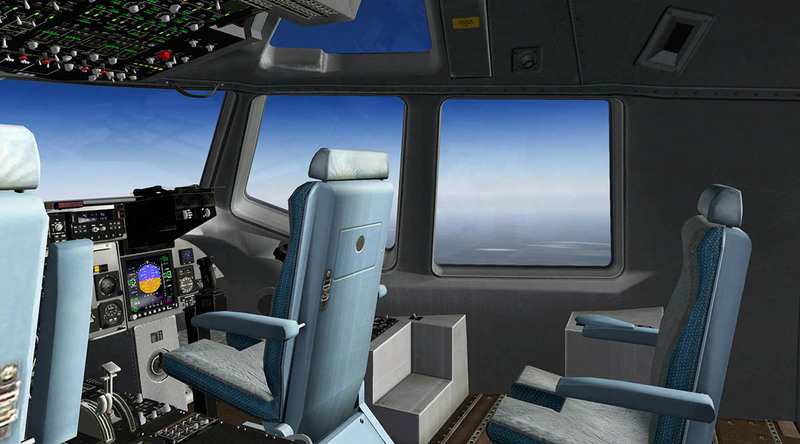 The aircraft uses the HDR lighting really well to give you a great range of lighting. 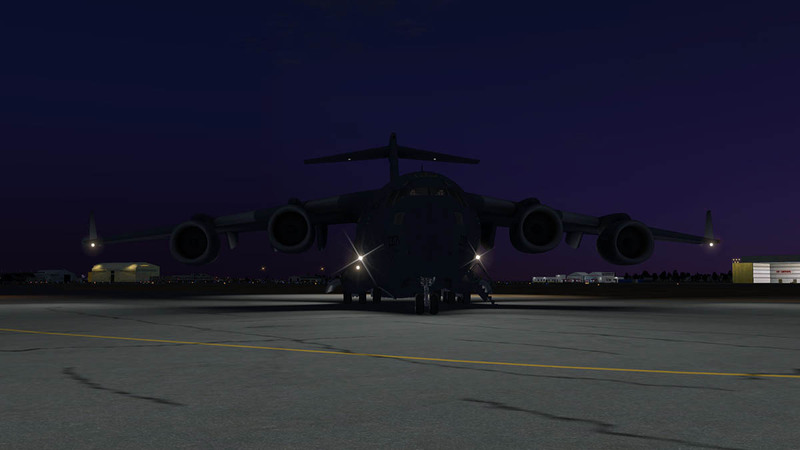 Starting the Globemaster is quite easy. Start the APU and make sure the power unit is running a 100% RPM, then switch it into the system on the Electrical Panel (APU PWR). Top of the overhead panel are the bleed switches which have to be off. On the fuel panel you turn the four fuel pumps on. Engine start order is 1-2 Pilot then 3-4 Co-Pilot and the IGN switches are mid-overhead panel on the far left - right. Hold down the pull switch for each engine and turn up your sound to hear the F117-PW-100 turbofan engine power up into life. The aircraft uses Turbine Sound Studios and Dreamfoil Creations specifically created sound, and hell it sounds great. From the sucking in of the air of the front of those huge whining turbines to the 3d dimensional jet flow to the rear it is just so brilliantly good, in the cockpit you have the same directional sounds but quieter that adds to the right effect. With 3D positional sound technology, the pitch, tone and type of sound changes as you move around the aircraft. Once all the engines are running and are at their correct performance numbers, it is time to clean up the overhead panel board. IGN off, Bleed off... APU off. and finish off the basic checklist that is supplied as part of the manual. 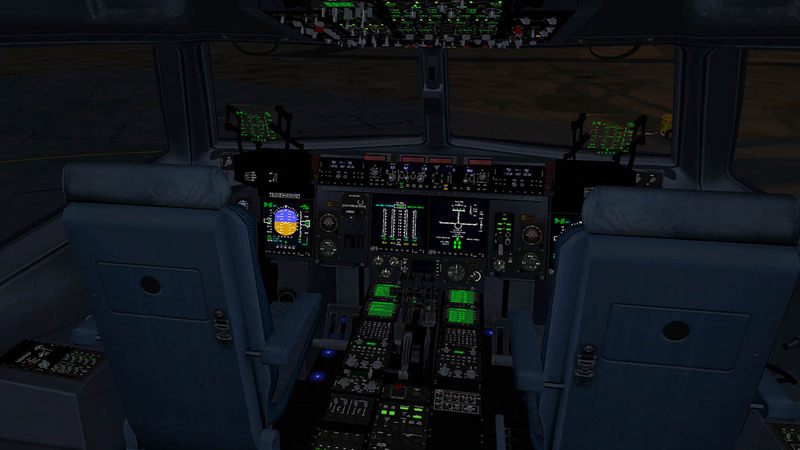 You are also supplied with an Excel C-17 Performance data sheet and two Ref sheets covering Optimum Cruise Altitudes and Ref speeds in V1, Vr, Vfr and Vsr. The turning circle is not as tight as you would think it would be, but if you are in a place that has no support ground crew the aircraft is capable of reversing itself via the reverse thrust to move it out of tight areas, certainly great to have but not a very efficient or quiet way of turning around. 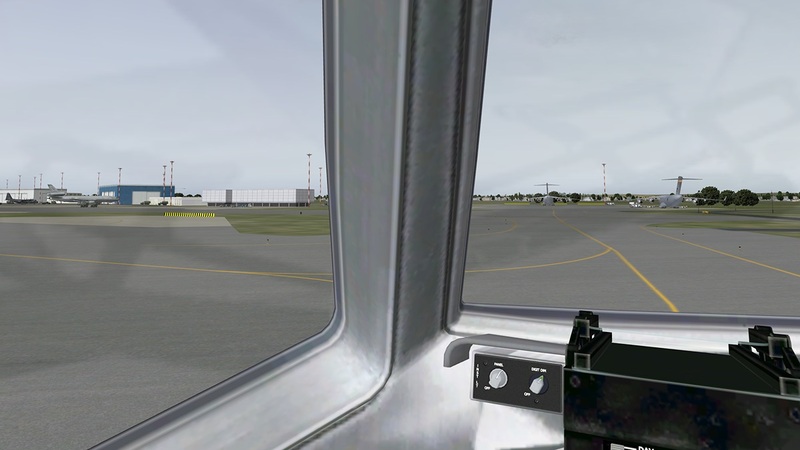 Once on the move you can easily manoeuvre the aircraft around tight taxiways (just watch those wide wingtips), as you can see down through the lower windows at the taxiway. 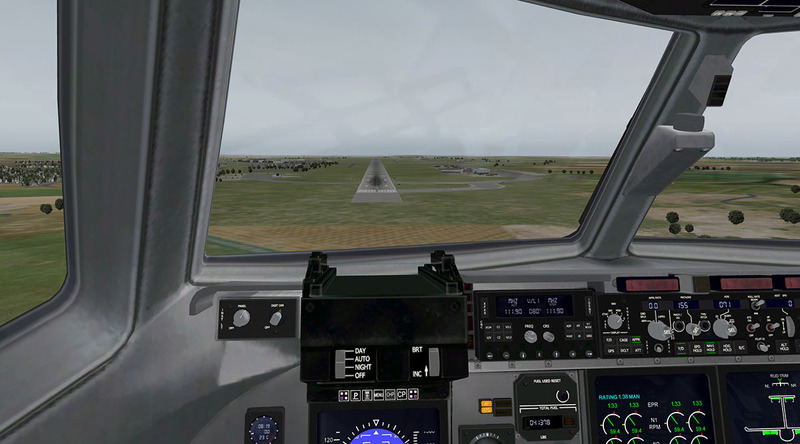 Takeoff is via RWY14 at Luqa and I set on the CNC panel the VOR 2 to 115.70 (Gozo) which is at the tip of Ghawdex the western most Island in the Malta chain. 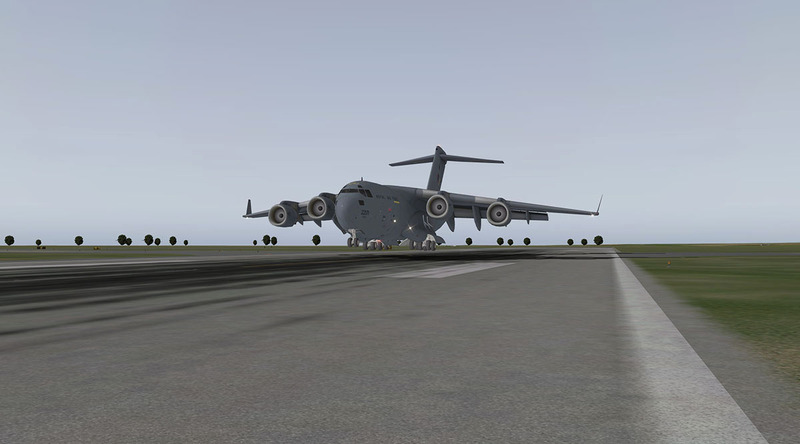 This is my jumping off point after I manually fly the C-17 from the runway and turn backwards to the north-west. I'm very heavy at that MGW of 581254 lbs, so the momentum is slow but you feel the power of the engines as well. 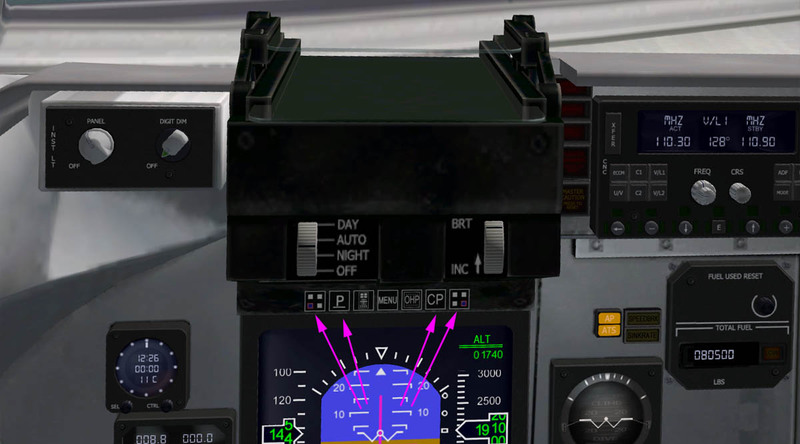 Flaps are set at 8º as the settings are (0°) to fully extended (40.5°) and are graduated in 4° tick marks with labels note every 8°. If you fly cargo heavies you know that the balance has to be found between lift and drag, and the C-17 is no different here and it takes forever to build speed to around 185knts to raise the nose. You are only allowed a limited time at full power and there is a countdown "MAX THR TIME REM ..:.. on how much time you have left on the engine display which is 4m:40sec, It may seem too little, but it does go a long way and you are usually off full throttle around 3000ft, if you increase speed at your final altitude the warning will come back on. But mostly you can control the thrust to keep it off the screen. Once in the air you are surprised how nice the aircraft is under the stick. 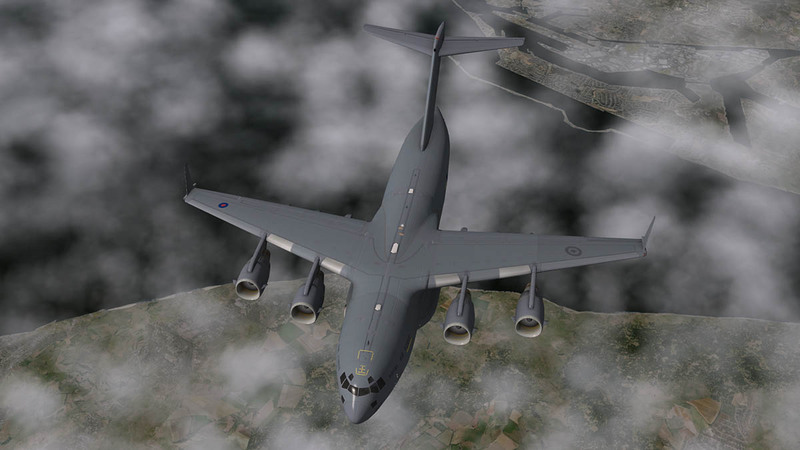 It will curve around at a good pitch of 10º although the C-17 likes a 7º up pitch better and is the best (on full MGW) sweet spot for speed and climb without over-straining the engines. 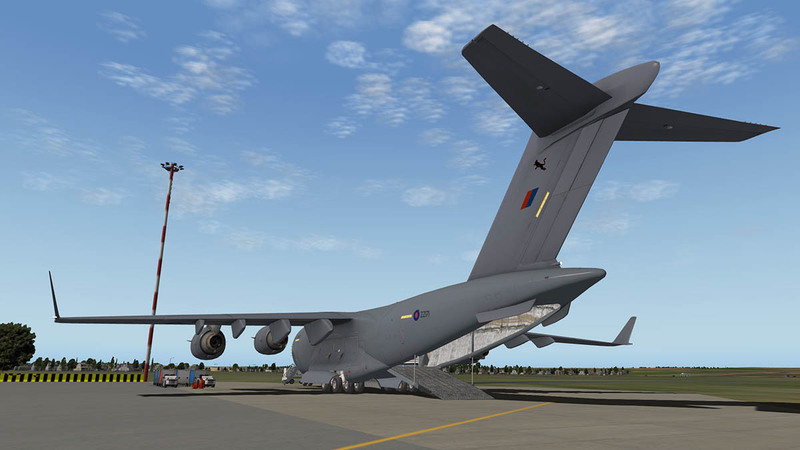 Turning in a big aircraft like this always gives you a thrill, and the Globemaster is no exception here. The windows are American style, in other words huge. So the Maltese landscape fills your view, and the lower windows shows you the join between the land and sea as you lock on to the 325º heading of Gozo. 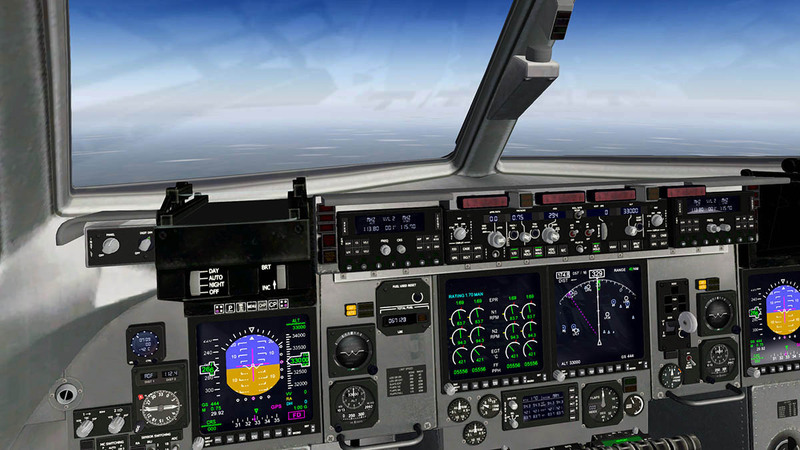 Set the A/T at 250kts I settle in at 7500ft to clean up the aircraft and execute the flightplan ->. The GPS button on the left side of the Autopilot does all three settings of Nav 1, Nav 2 and GPS (Shows on the PFD) and you press the odd NAV 1 HOLD button to lock in your flightplan (LNAV). I'm not totally crazy about the large rose on the ND (Navigation Display) I navigate my turns and rely a lot on a good rose compass and here it just looks heavy and not very practical as a tool either. 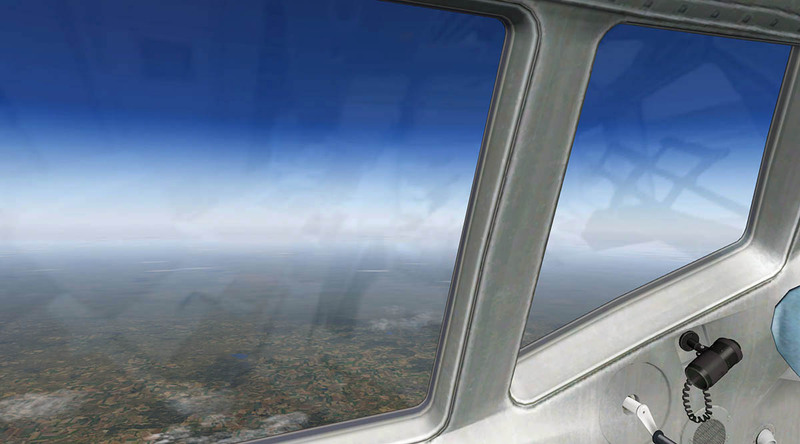 Time to climb and I set just under the MGW altitude at 27,500ft (FL275). 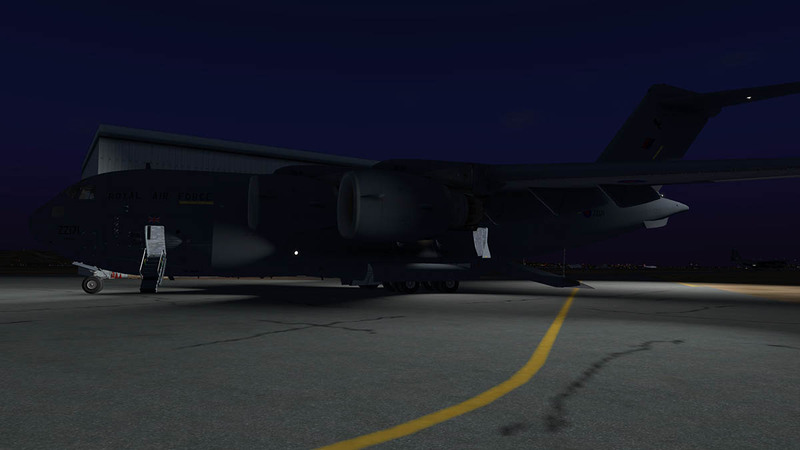 You climb like a heavy cargo aircraft which in a way a transport aircraft of this size is. 1600fpm will take you to the low 20,000ft marks, then watching the power band I found I best was then a lower V/S of 1000fpm to 24,000ft and then 600fpm to the target altitude was very smooth and the best compromise. 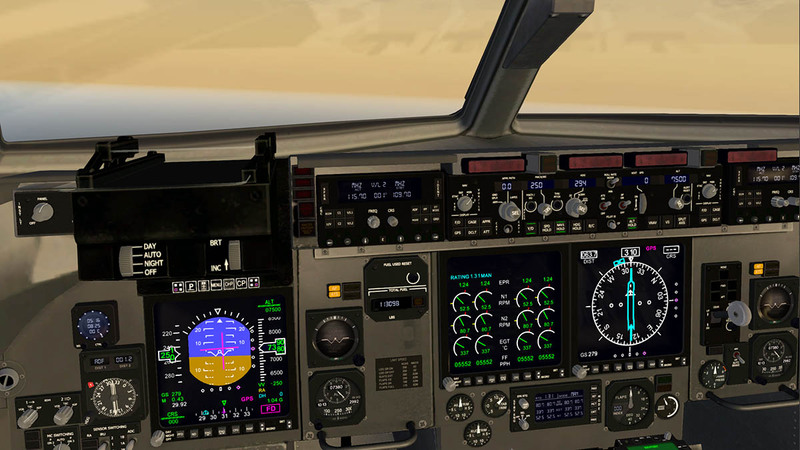 My final altitude was 33,000ft (FL330) but that would be stepped over Sardina at 300fpm per step. 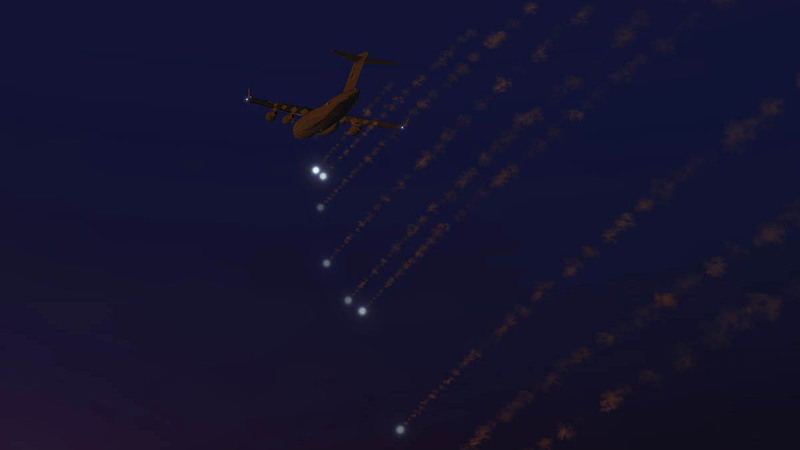 The aircraft being military has ‘Slime Lights’, ie. The formation markers at various locations on the aircraft exterior for refueling and night-time exercises. If flying away or into a danger zone you have a built in Aircraft defensive system. To deploy these decoy flares you must first arm the system using the small green button then deploy them with the large red button which is highly exciting to push that button and see the swirls of lights going down behind you. As the coast of Sardina not far from Calgari looms out of the Mediterranean Sea. 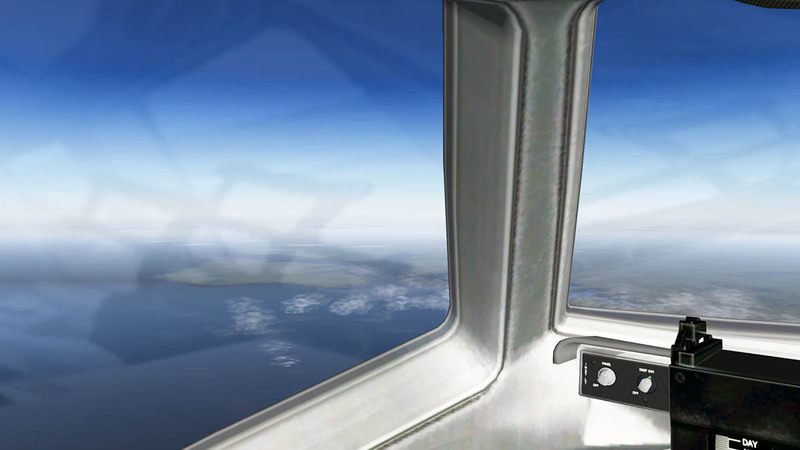 X-Plane turns on the dazzle, It is as blue as the Mediterranean blue can be and you can feel the brighter lighter light. There is no doubt the great design work here by Virtavia. The aircraft is excellent in now the growing brighter morning light. It is a transport, but there is still a beauty in the aircraft's design. It is a mulit-role aircraft but its main is moving parts of the world to another part of the world quickly, and here it excels at that job. High above Sardina with those huge turbofans grinding away It feels like you are top of the world. I am done many, many nautical miles in this C-17 and I love it every time I have to go somewhere, and that is the best recommendation you can give for a design, as it is more than a good aircraft, if it feels right and looks right (and sounds right) then you want to be there doing another flight to another destination.... And the C-17 covers all the bases. I not getting too carried away, These crossover aircraft from MS FS will never have the full systems and details that a built up X-Plane aircraft will have, as a few areas feel wanting. But in the majority the aircraft more than covers the bases and does and delivers what you want from a product of this price range. 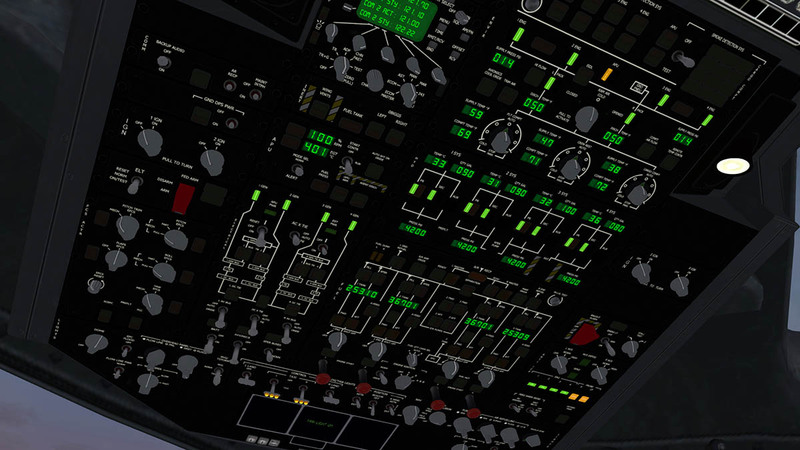 Small details are good and that is what counts, like the manipulators on the autopilot panel. Big half-moon - or + strokes for the 1000 movements and a circle - + for the 50 movements makes adjusting the altitude easy, quick and focused. The autopilot is very good, clear and efficient. Items are noted on by their green stripes on the buttons. Only issue was that Rose on the heading, as the heading bug is too large and not very precise and in the standard MAP view the heading disappears completely if you are doing anything more than a 90º turn. Take a breather for an few minutes in the rear and the view is again very good. The reflections are excellent, more so in that very early morning light. Only slight annoyance was the HUD is noticeable in its up position in the glassware but down in reality? The side panels for oxygen and communications are more accessible in the rear and look good. One thing I didn't like is that the cockpit door is solid, you can't go back into the cargo hold unless you have a free moving plugin, I found that a real restriction if I wanted to check the cargo or take a view from the rear. As the English Channel approaches on the French coastline it is time to descend. 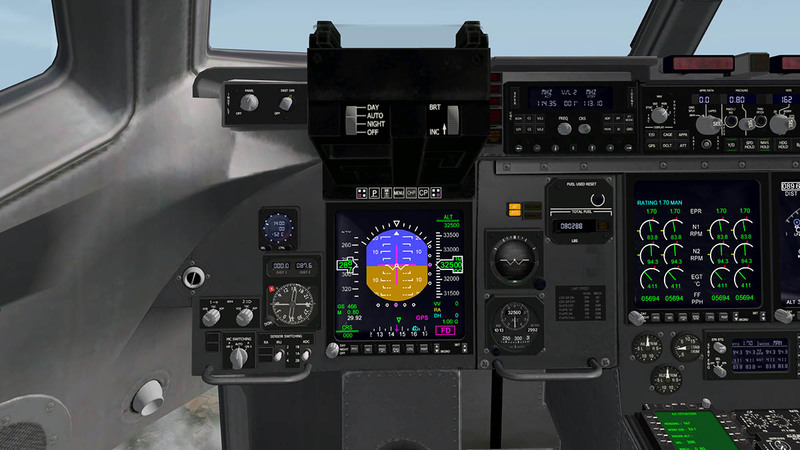 I set the altitude to 6000ft and let the negitive V/S vertical speed of 1600fpm bring us down. The numbers seems to wizz past quite fast and you feel like you are falling fast, maybe its is the weight of the aircraft? But don't be tempted to lesson the fall rate as you are descend normally as you are correct even if your senses tell you that you are not. 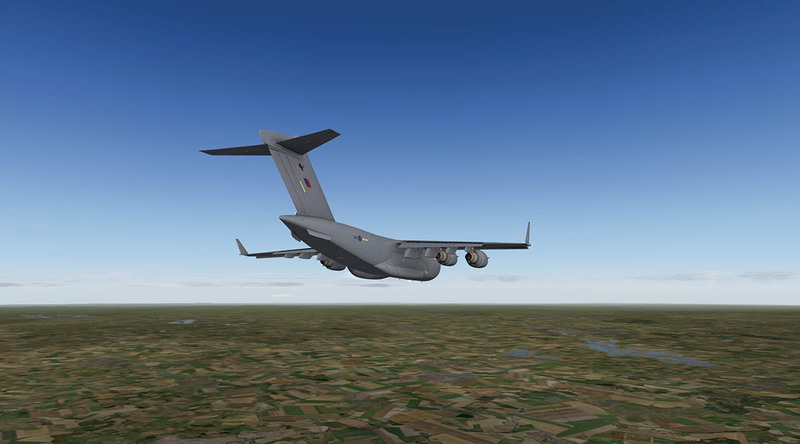 I pass 10,000ft as Southampton fills the right side of the aircraft on a direct path for EGVN-Brize Norton which is in Oxfordshire in the central southern England. Compton (CPT) VOR-DME (114.35 MHz) is my entrance in and I continue till I turn 260º on a circuit pattern that directs me towards RAF-Fairford which is just the south-west of EGVN. Wind is quite high behind me at 14knts so I have to watch the flaps and speed. 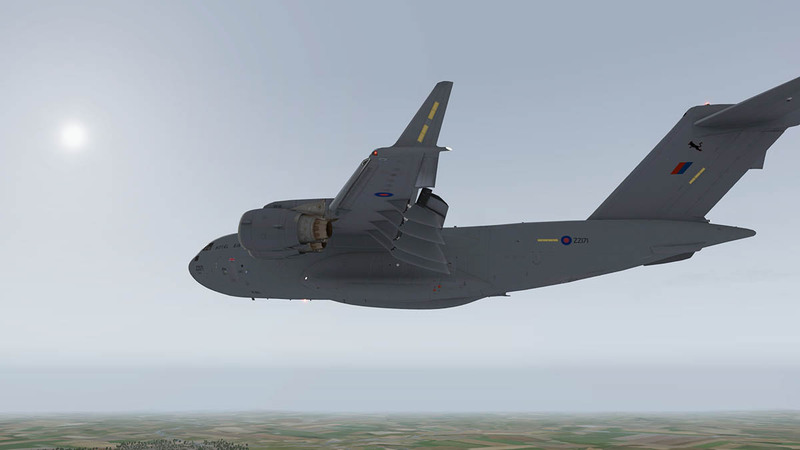 These huge transports are built to manoeuvre at low speeds (for slow passes or landings) and I was again manually flying the aircraft and dropping the speed to 165knts at 16º flap. 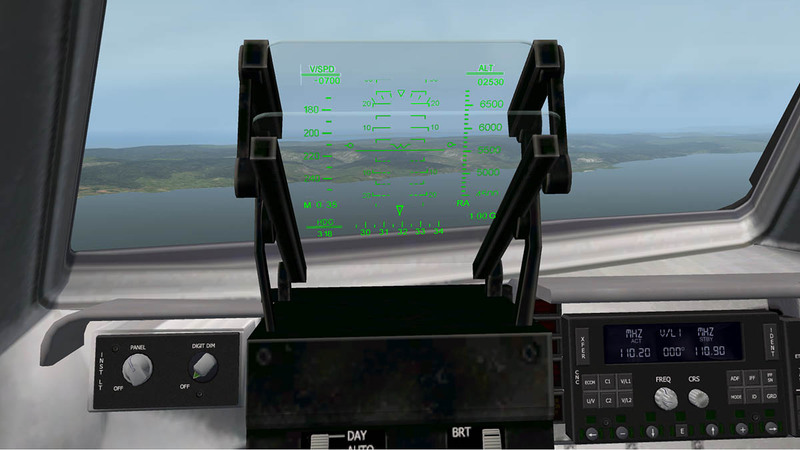 In the circuit I turn 90º then 90º for 08 approach and I found the aircraft very sensitive in the headwind adjusting the speed and flaps for landing. The zone in speed was very small and get the speed too high and the nose dipped, to slow and you were stalling slightly. It must be all that drag and lift. The C-17 is designed to operate from runways as short as 3,500 ft (1,064 m) and as narrow as 90 ft (27 m) and can operate from unpaved, unimproved runways. 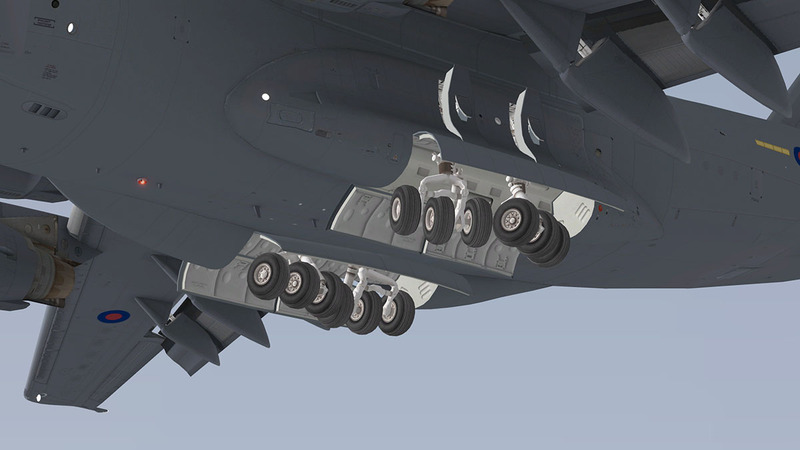 The engine's thrust reversers also directs engine exhaust air upwards and forward, which reduces the chances of foreign object damage by ingestion of runway debris into the engines. 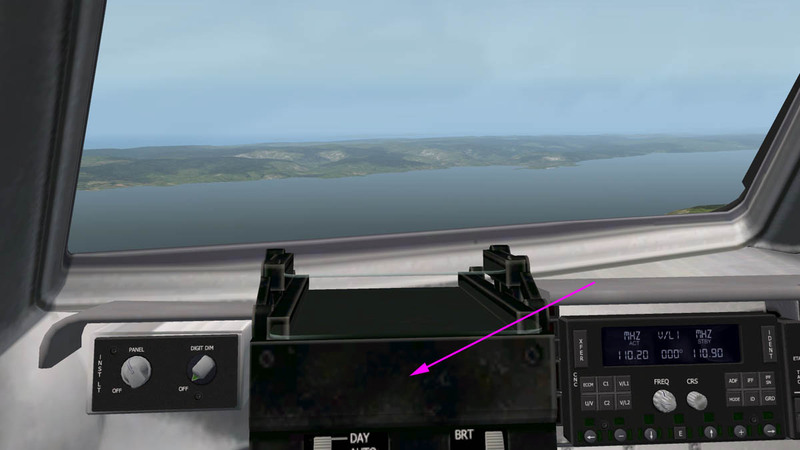 Aligned up to RWY08 for a landing final at EGVN is 1700ft and speed 155knts. You are very impressed with the excellent animations. 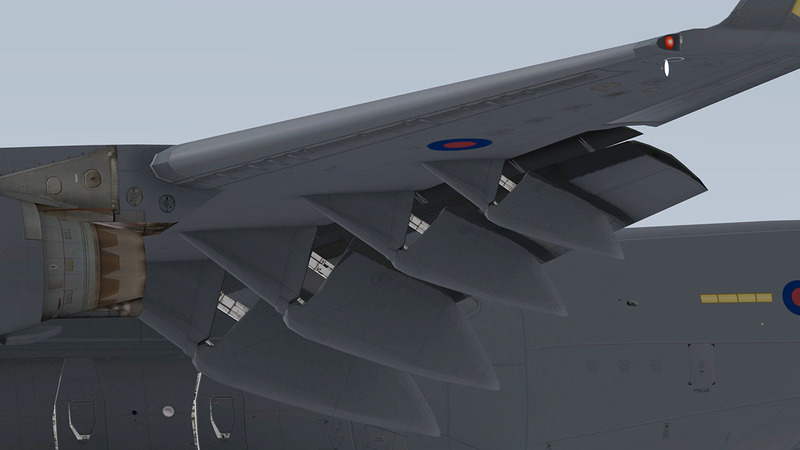 Flaps and leading edge slats which on the real C-17 are also blown like the FOD (foreign object damage) are replicated perfectly. The undercarriage is also superbly done as the huge gear (three wheels per set) has to rotate as well as lower down and out from the fuselage. 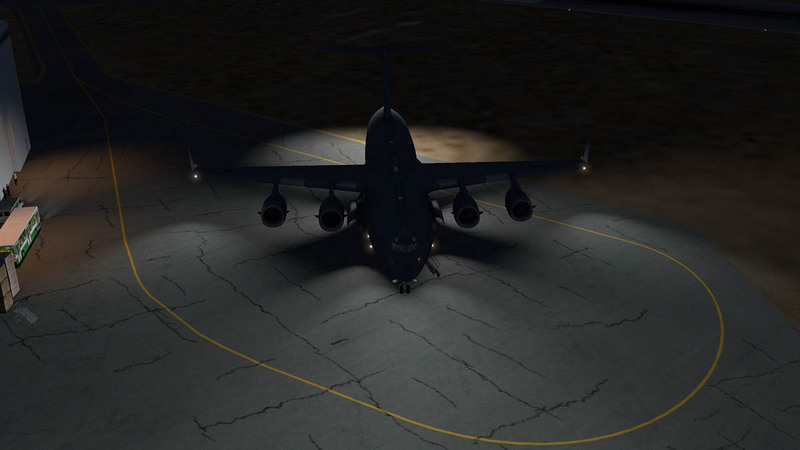 Landing heavies are always interesting (sometimes nerve racking), But the C-17 is going about 20-30kts slower than your usual heavy aircraft approach and you feel you are under your stall area, you are not of course but you do note the line is closer than you think. So speed fine-tuning is a big part of your landing regime and you have to be using the throttle to control with that last bit of descent down onto the runway (In other words let the aircraft down really slowly and in control). 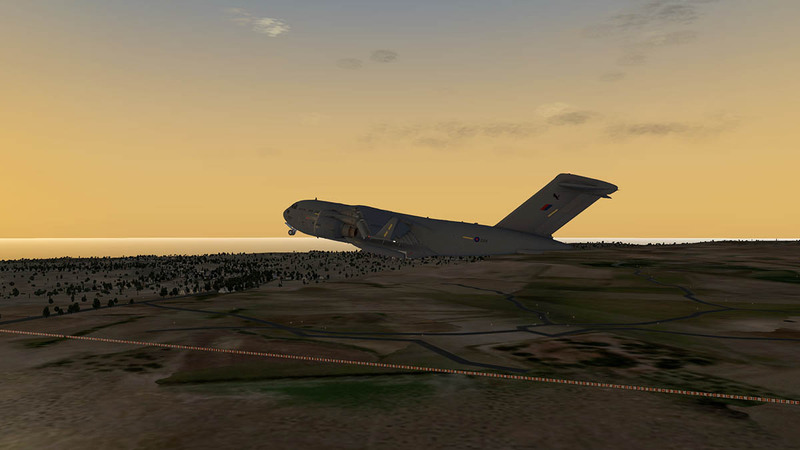 But you feel the transport captain you are, the C-17 aircraft is awesome on approach... and you are in control. Once on the tarmac the sheer weight you are carrying comes back as you feel the heaviness of the aircraft. 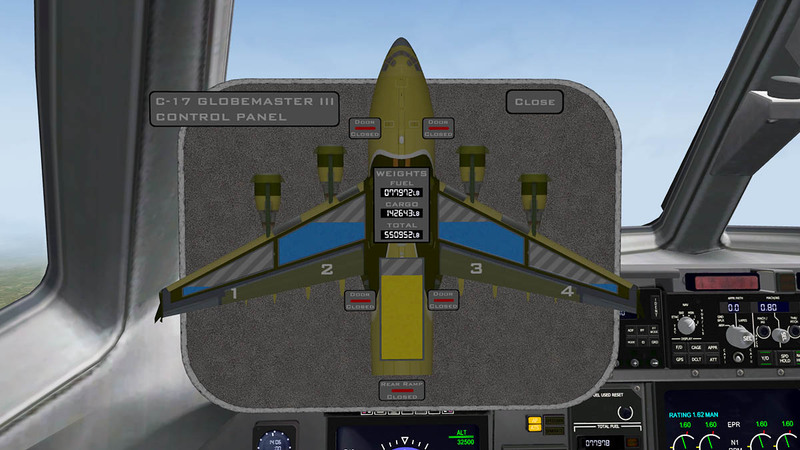 The thrust reversers are activated (I have the reversers set on "toggle" on my joystick) and up goes the "spoilers", that are manual if you remember, you have to hit your "spoilers up one" a few times (two) to get the full extension (you can use "full" but that is waste of spoiler control). The noise from the huge F117-PW-100 turbofan engines in reverse is immense, almost deafening but exciting. (full sound volume is certainly recommended) and you feel the whoosh of air as they close down again after the full reverse thrust performance, and you are down to your taxi speed and normality. Back home at Brize Norton (BZZ) in Oxfordshire it feels only hours since we left and the weather is typical English grey and a big difference from the Mediterranean bright blue from just a few hours earlier, in fact it has been a whole day to the bright sunshine and back to the grey again. 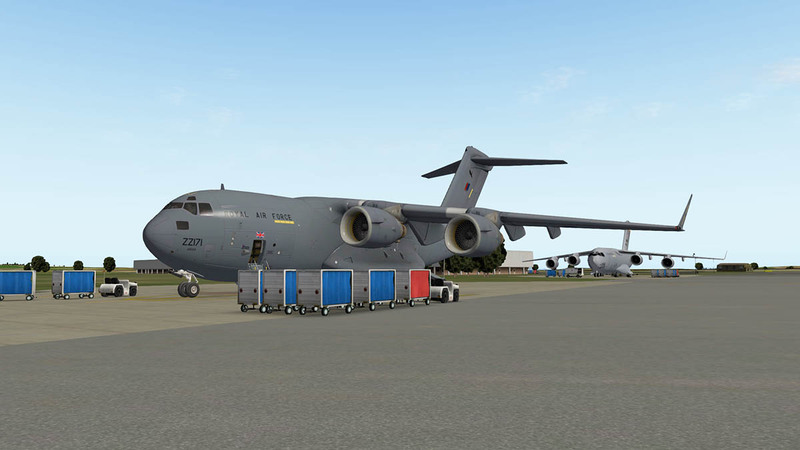 Taxi speed set and I was directed to the Terminal (receiving centre) that is the UK military's version of an exit and entrance to going overseas via taxiways E and then D.
Once the huge C-17 was berthed you open it all up and start unloading the cargo and passengers. It is a monster of a machine when you look at it close up, but beauty is not in the eyes of logistics. 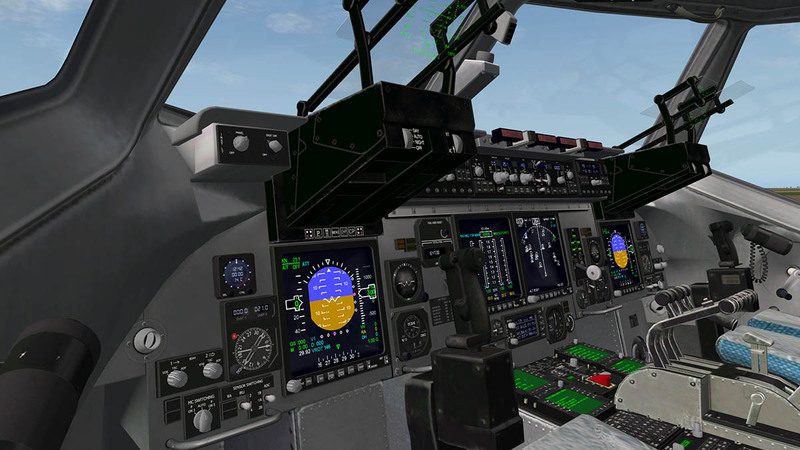 The C-17 Globemaster III has a job to do, and it does it very well. You have a huge choice of 12 liveries. Five are U.S. Airforce in Mississippi ANG 183rd AS 'Spirit of the Purple Heart', McChord, McGuire, March and Hickham Airbases. 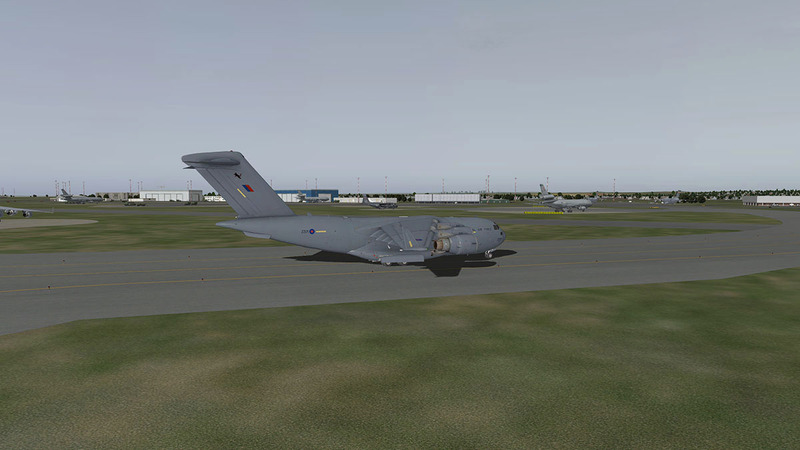 Commonwealth Airforces in RAF, RAAF and the CAF. A Nato livery and two QATAR aircraft and one of those in QATAR airline colours (don't ask me why?) and finally a great Primer (factory) aircraft. 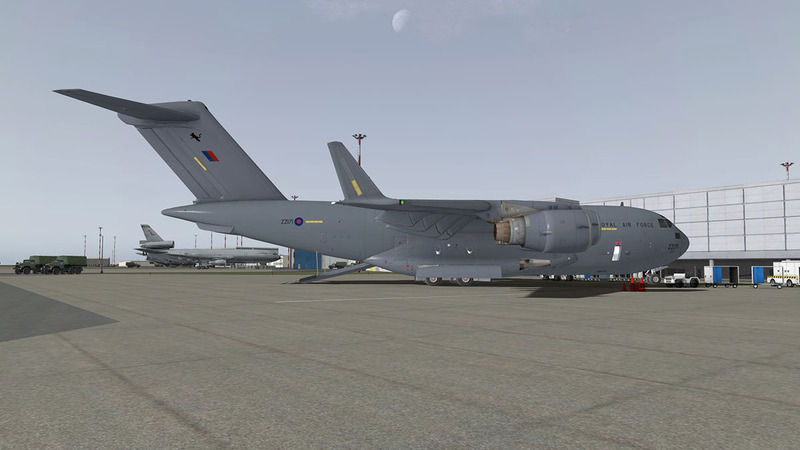 I am not going to overlook the facts that this C-17 Globemaster III is a few years old now in X-Plane and the aircraft has had only two updates in that time since. And yes it does not have either the complete functionality and systems that we have come to expect from current deep system aircraft. 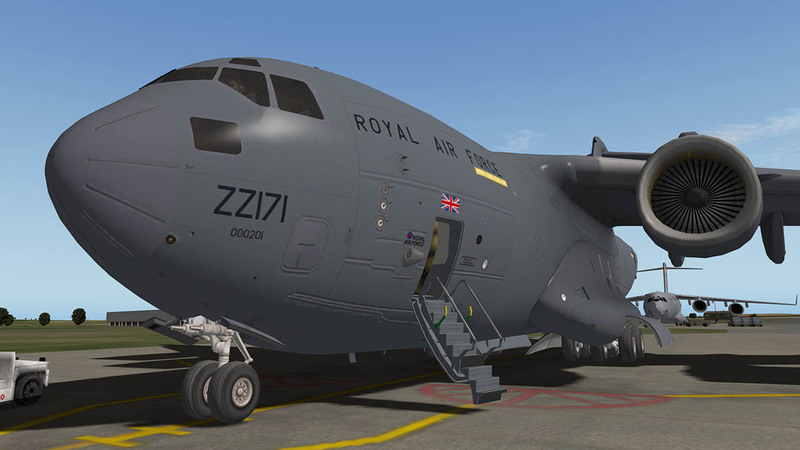 In its defence it was only originally a conversion from a MS-FSX release and not a complete ground up construction directly for X-Plane. So there was not a lot of room to manoeuvre in the 3d modeling and texture areas in the crossover which are very good anyway. 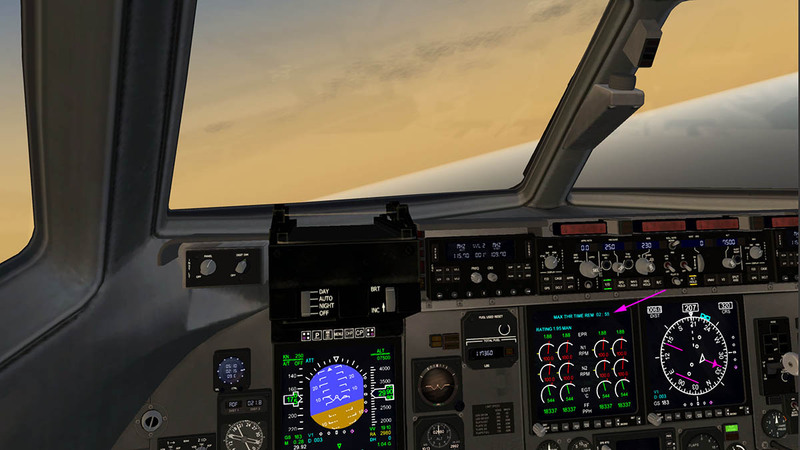 Where X-Plane enhancements could be done, then they were introduced like with the great HDR lighting and DreamEngine sounds which are far better than the original TSS soundset. Really good animations and features will mean great functionality and mission differences, slime and decoy flares are both authentic. It has a few military quirks to get your head around in the cockpit, but overall it is a great aircraft to fly and go long distances in, of which I have done so over the years. I don't like the compass rose and found it hard to use. It may be actually authentic, but it doesn't look it. And lot of things don't work, but even the joystick on the Co-Pilot's side could have been made to disappear like the pilot's. Small things but you are used to such niceties nowadays in other aircraft. 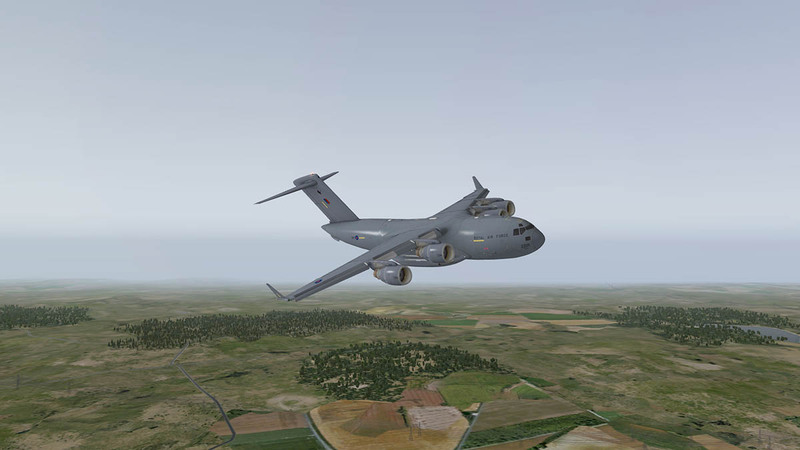 The C-17 handles far better than you would expect an aircraft of this size to do, It wants you to fly it manually, and that is a good thing and rare for a transport, only to watch the flaps and speed that need practise to get the them to perfection. The results speak to themselves. 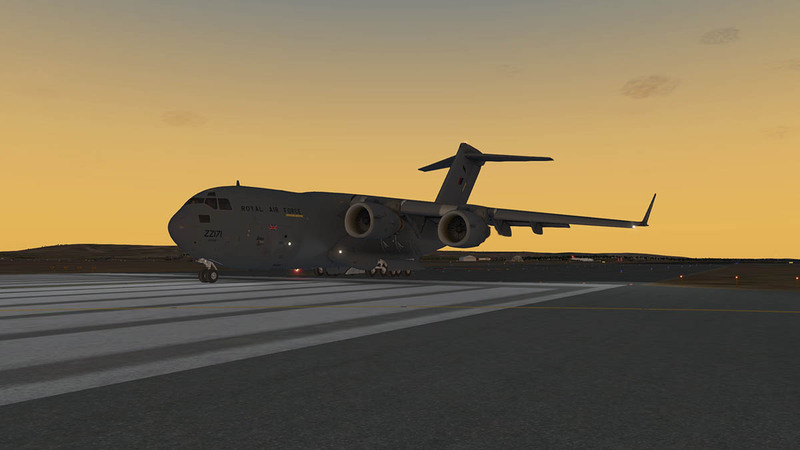 The C-17 Globemaster III is a very popular aircraft and you can see why it is a great investment. I have had a lot of really great flying in this aircraft already, and this profile has brought back why I really like this aircraft. 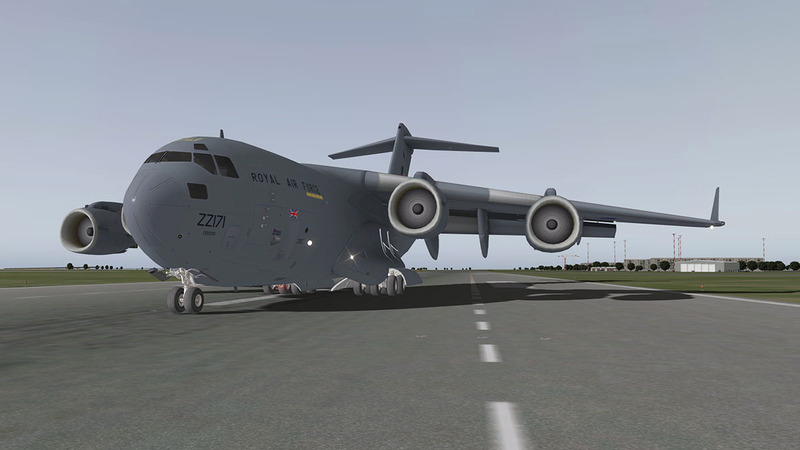 It fill every need and really good Military transports are rare in the X-Plane simulator and the C-17 is one of the best to fly and even look at... It just looks a great aircraft and that is because it is a great aircraft. 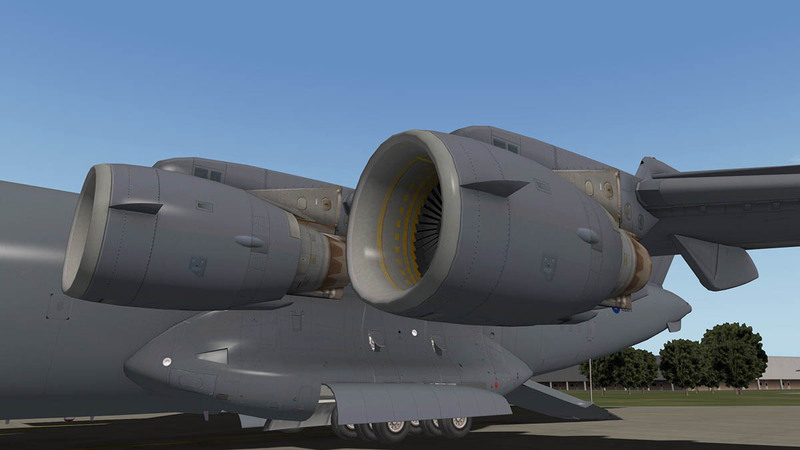 Installation : File size is 359.40mb to your X-Plane - "Heavy Metal" Folder. Documents : C-17 Pilot's Manual, Two REF sheets for Optimum Cruise Altitudes and Ref speeds in V1, Vr, Vfr, Vsr and a Excel C-17 Performance data sheet. 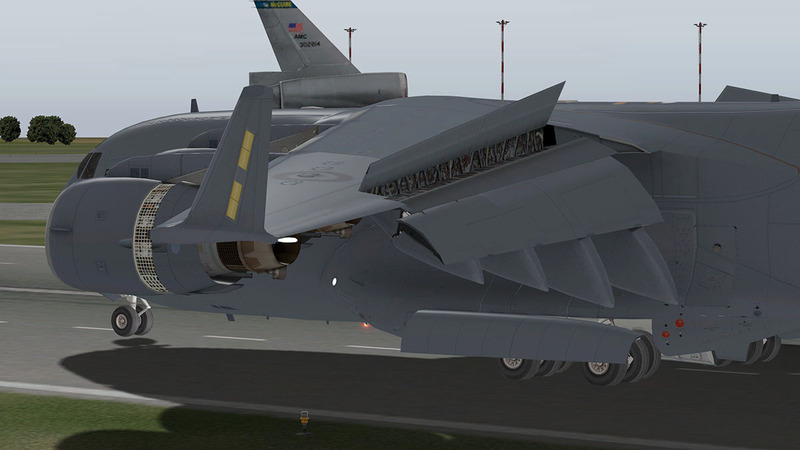 Many custom animations including landing gear, thrust reversers, all doors, 2 position rear ramp, flaps, speed brakes. 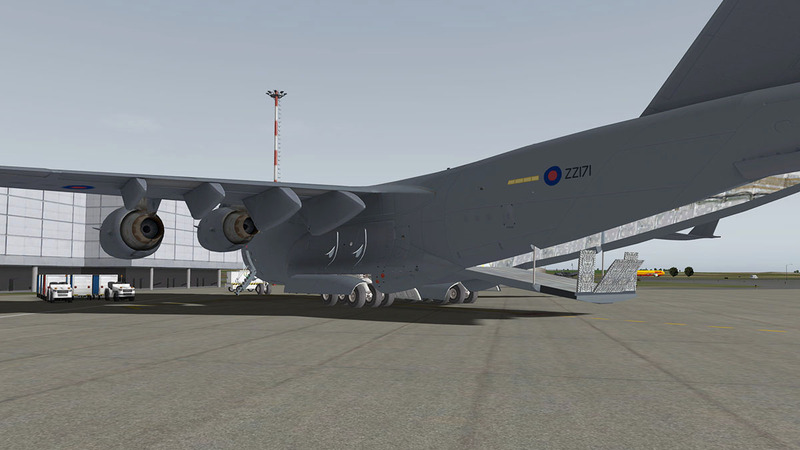 Realistic handling including modelling of brown-flap high lift wings. Detailed and functional Autopilot panel. 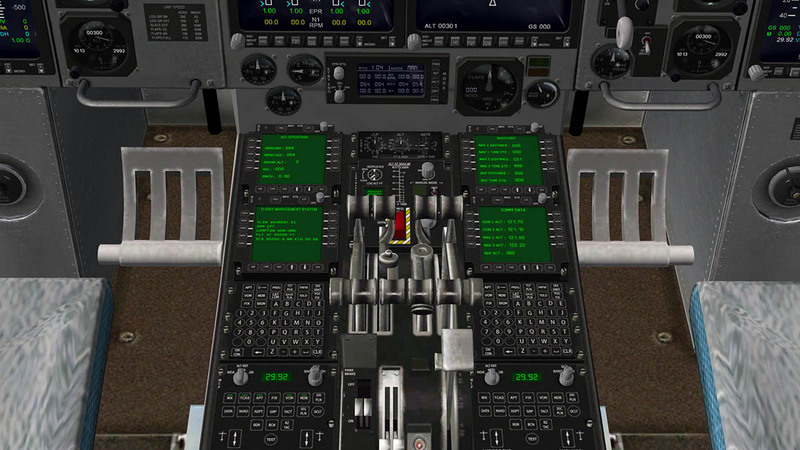 Detailed Standby Engine display with preset thrust level buttons. 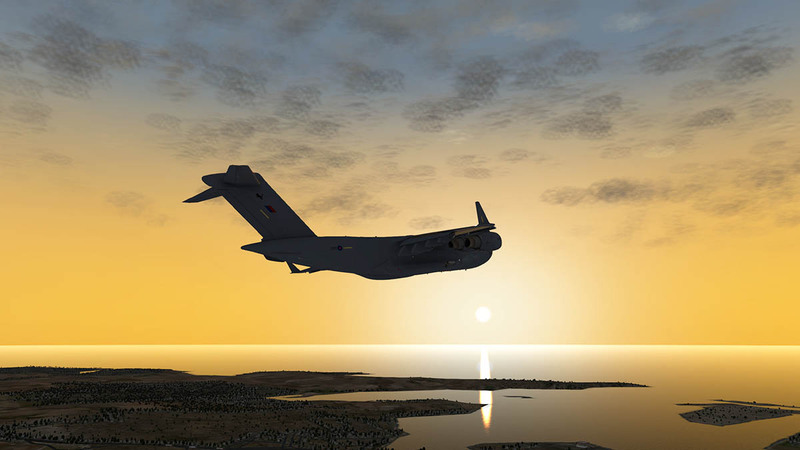 Flare deployment - Exterior lighting designed to get the best from HDR in X-Plane 10. Detailed startup procedure - - Custom warnings and caution panel. Toggle hide control column and folding seat arms. Interactive cargo load dependent on weight. 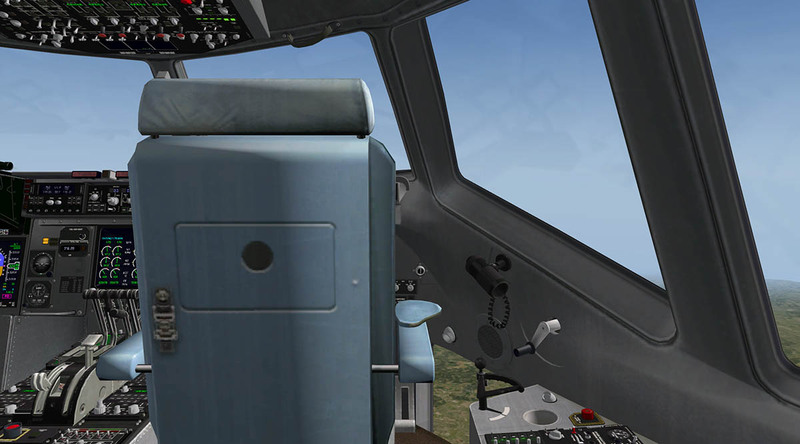 Cabin Pressure Panel, Windscreen wipers, Adjustable pedals, Functional fire extinguishers. 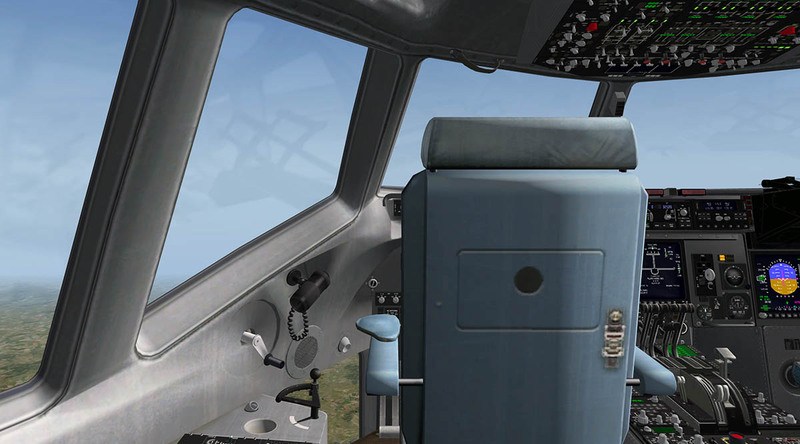 Interior and exterior cockpit models to maximize frame rate. 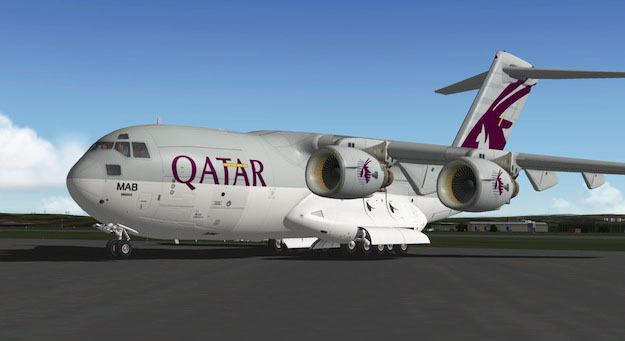 12 liveries with bump maps - 30 page user manual with full checklist. I personally found the aircraft model to quite well made, with good detailing on the cockpit. The flight management system also operated well.